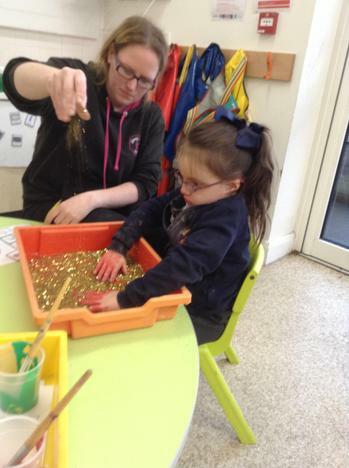 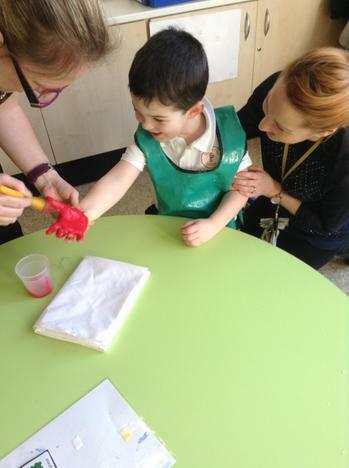 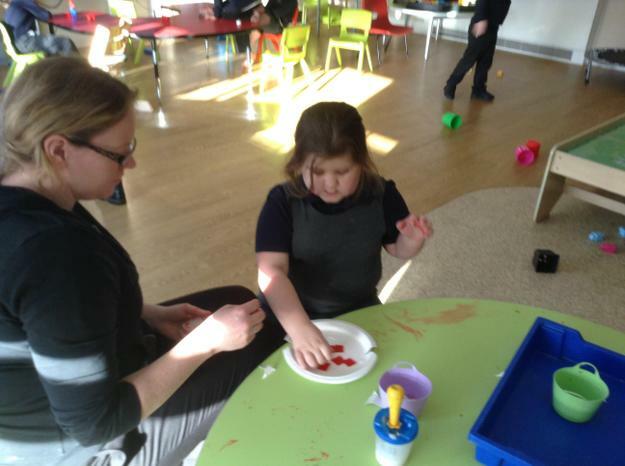 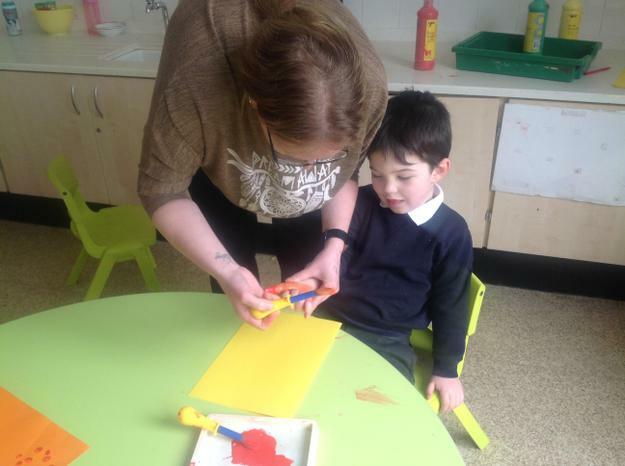 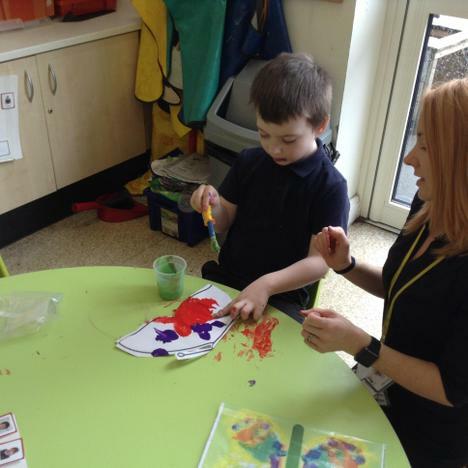 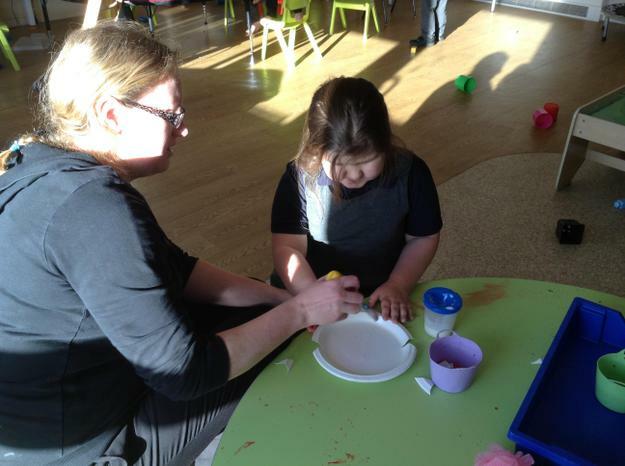 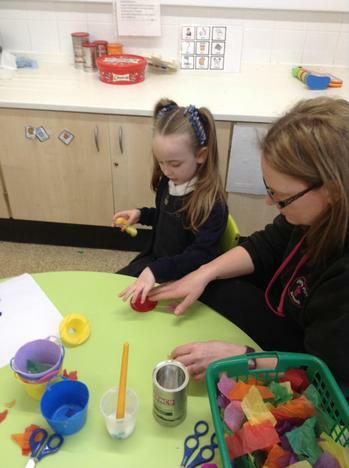 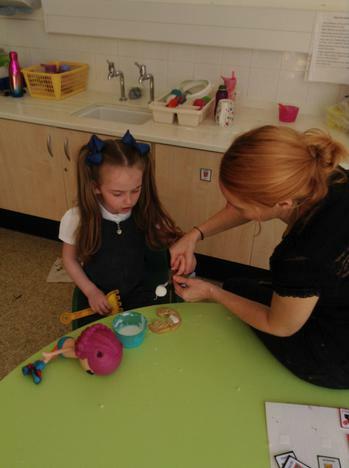 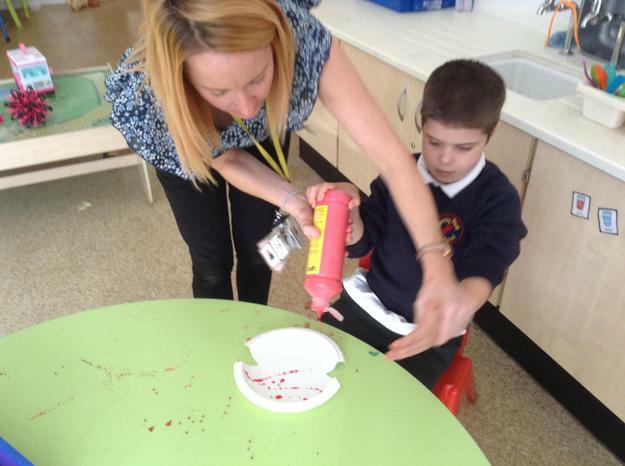 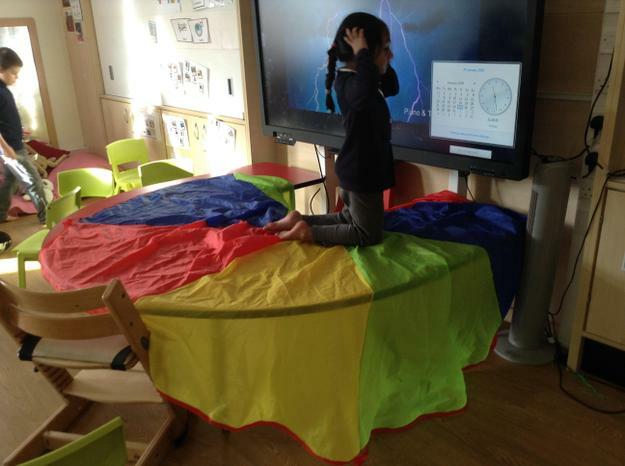 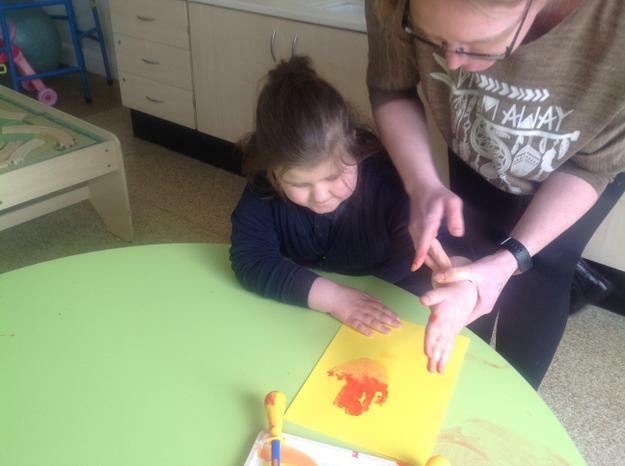 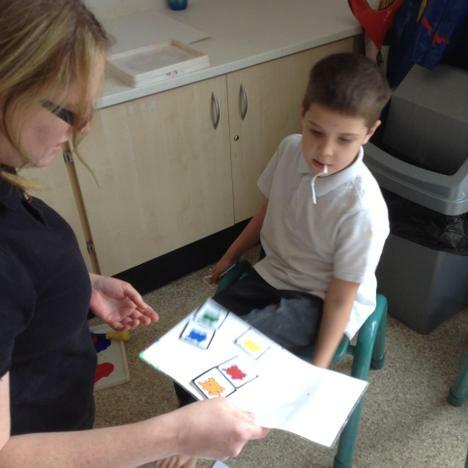 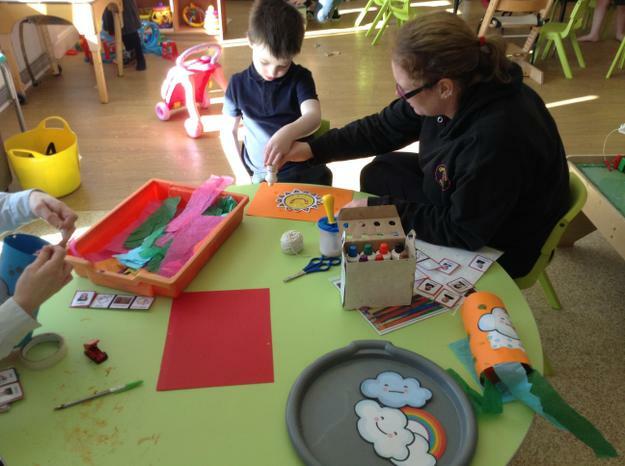 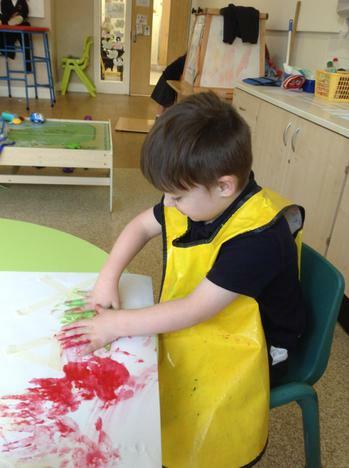 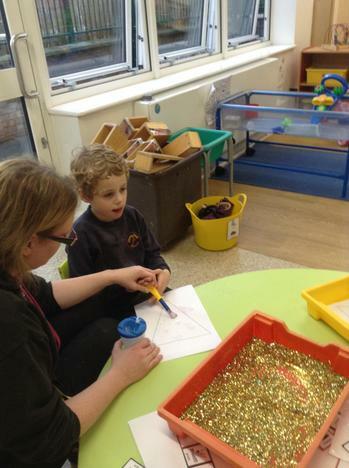 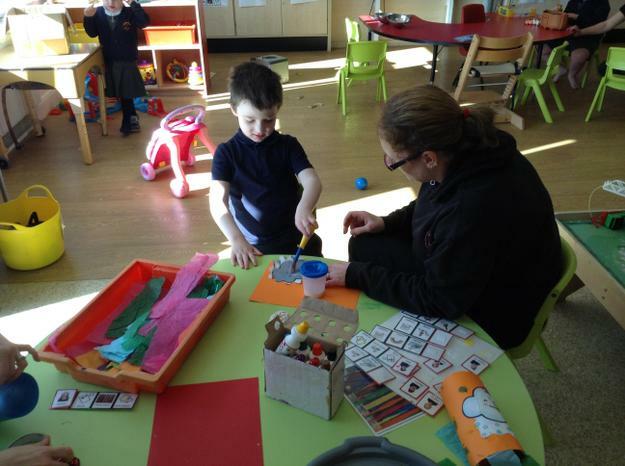 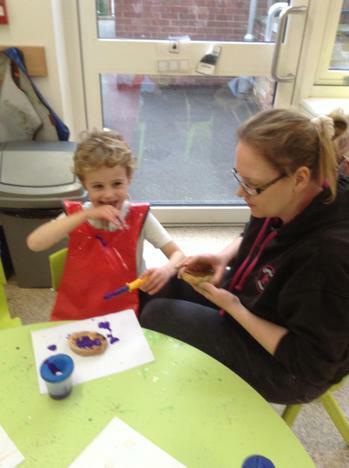 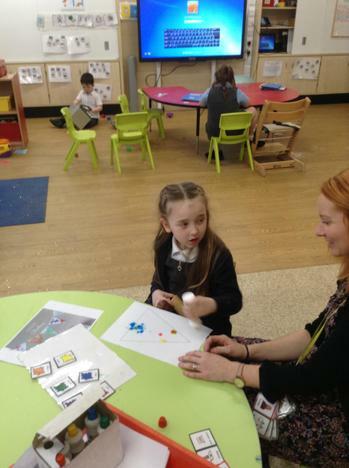 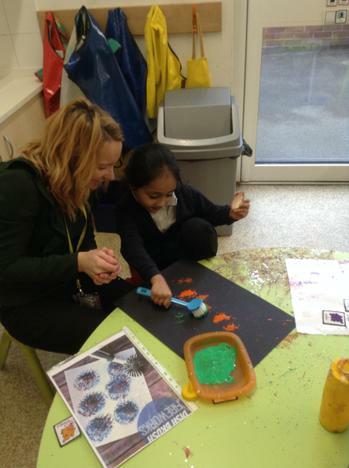 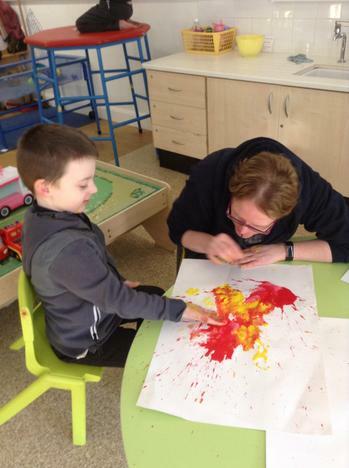 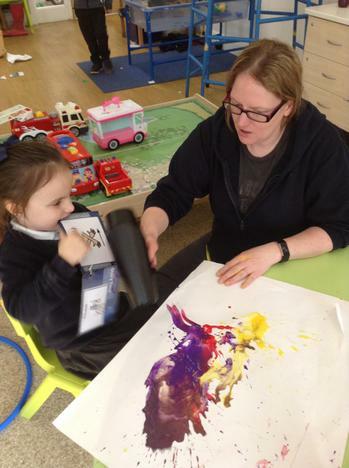 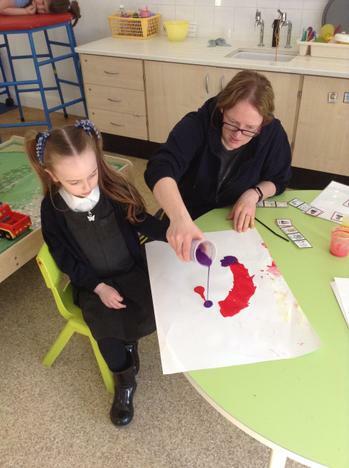 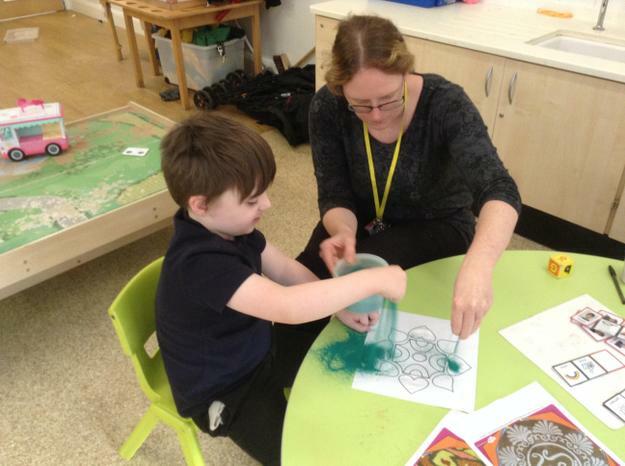 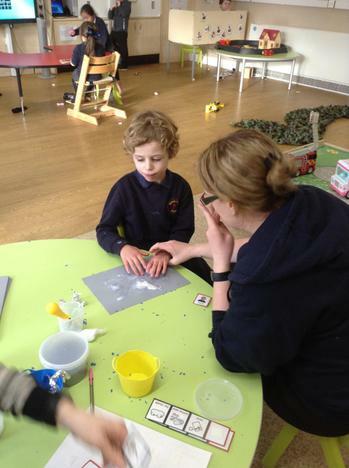 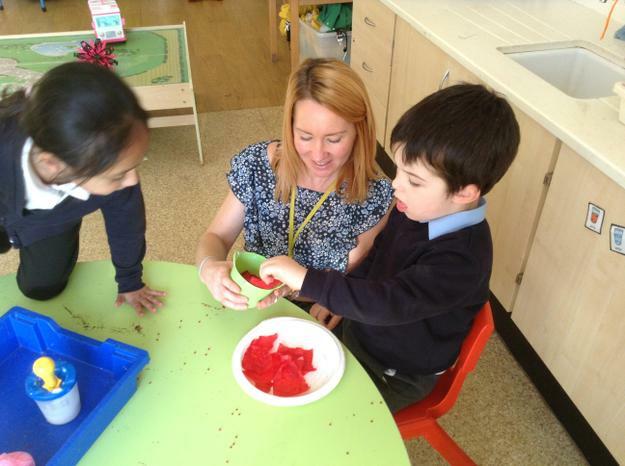 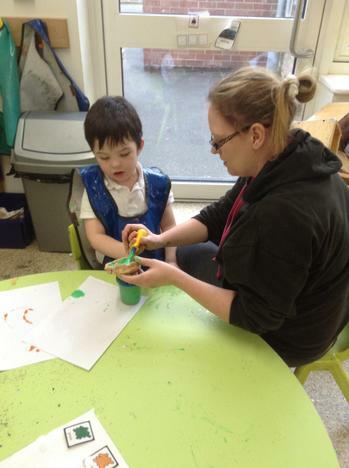 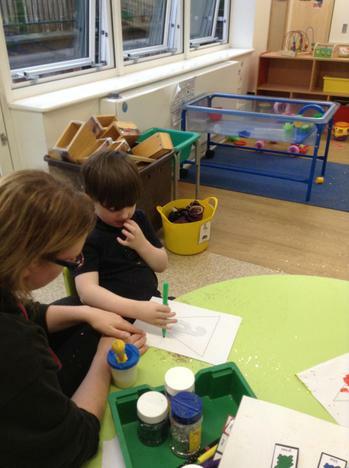 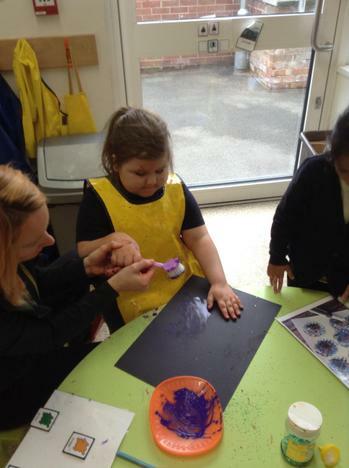 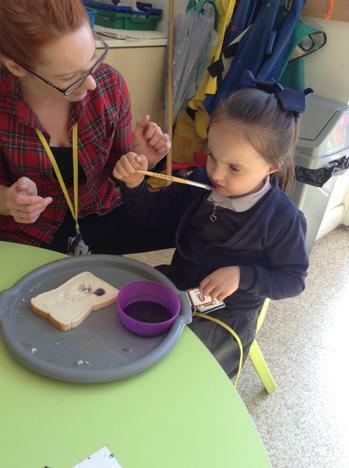 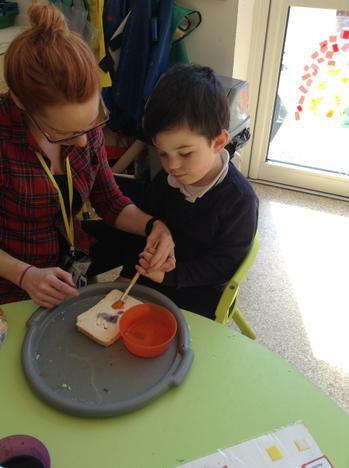 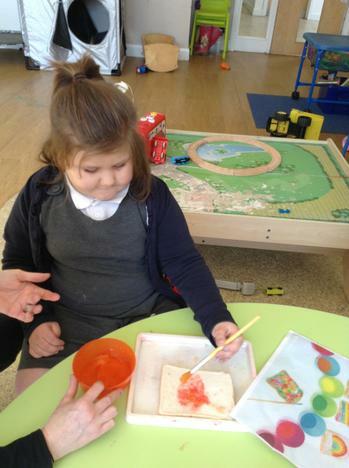 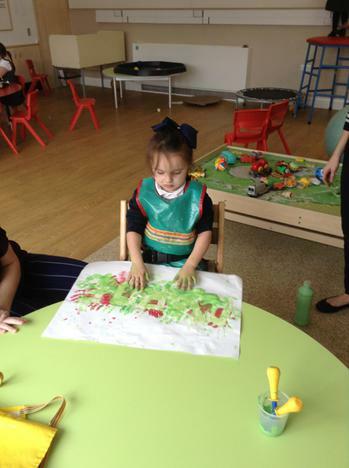 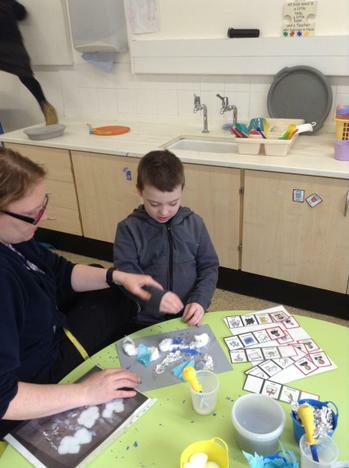 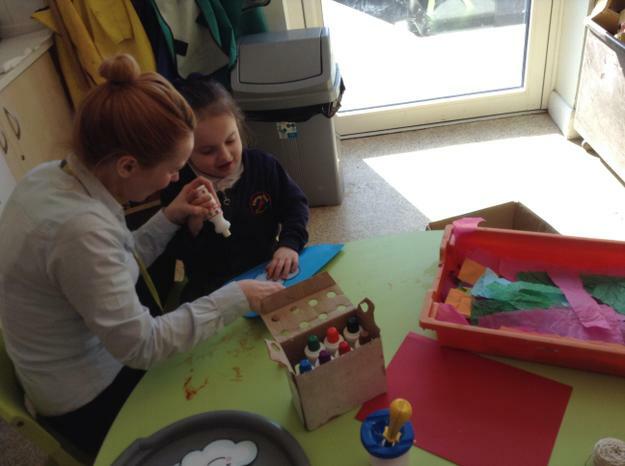 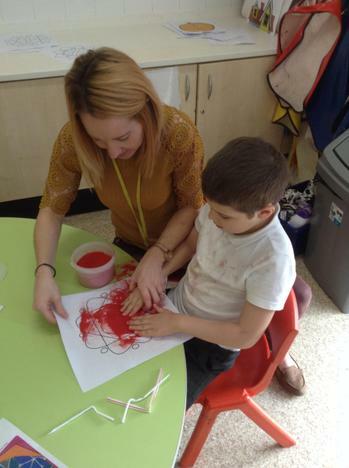 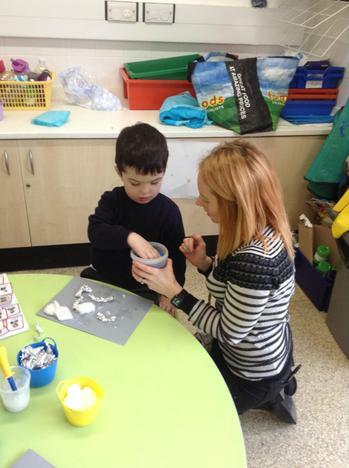 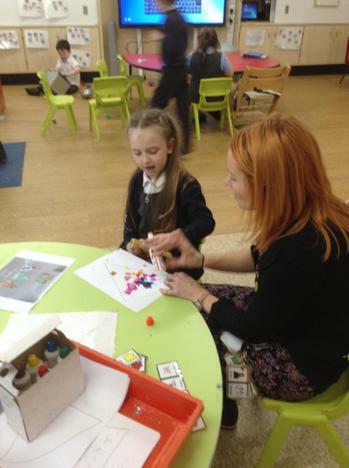 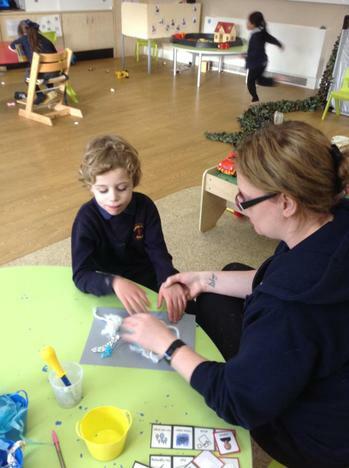 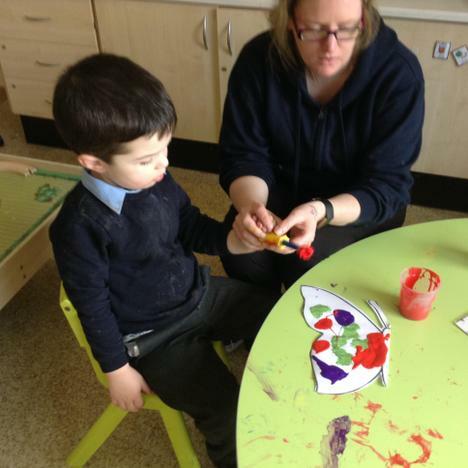 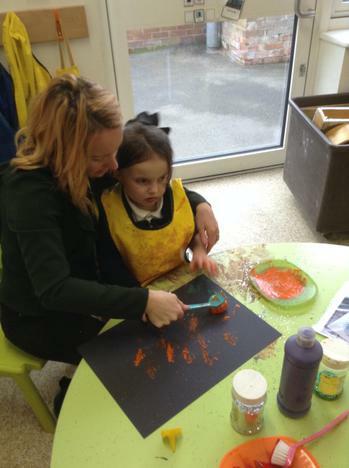 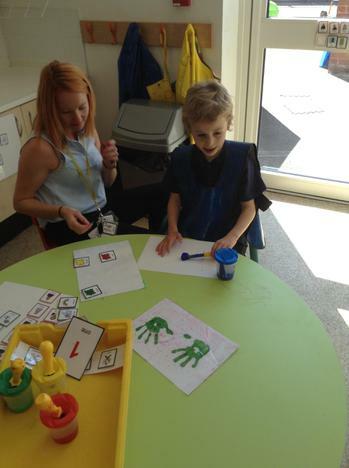 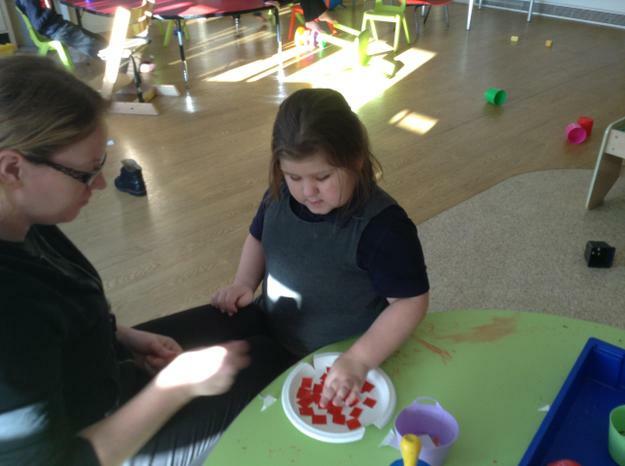 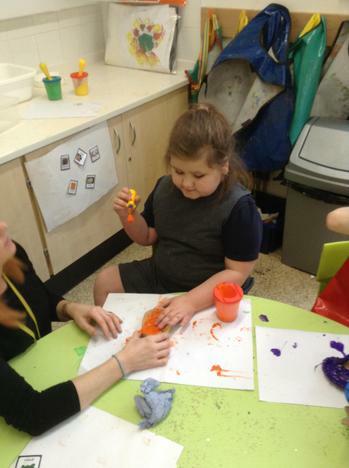 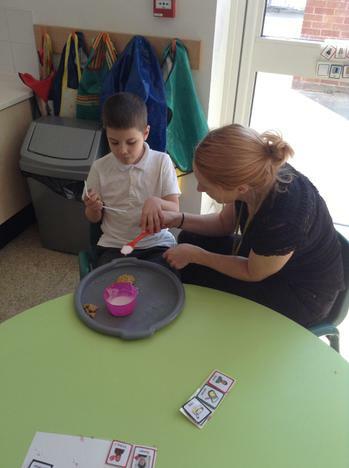 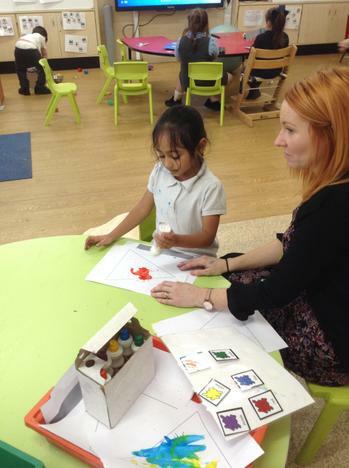 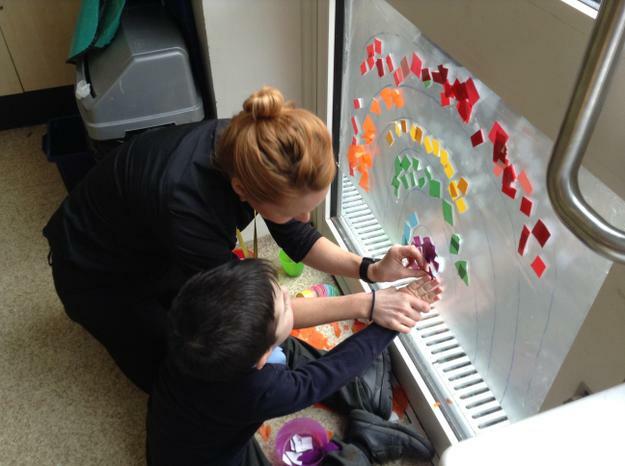 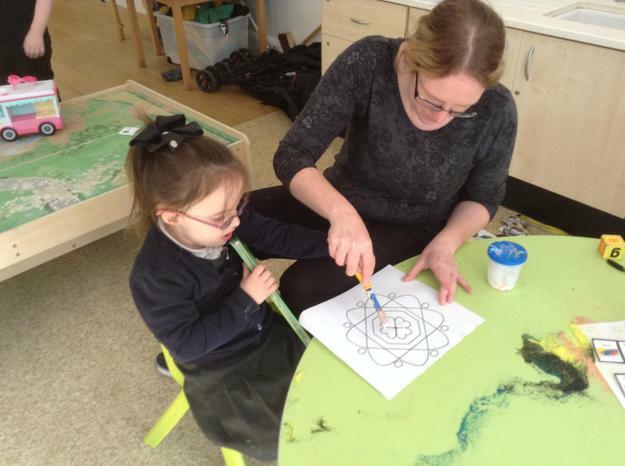 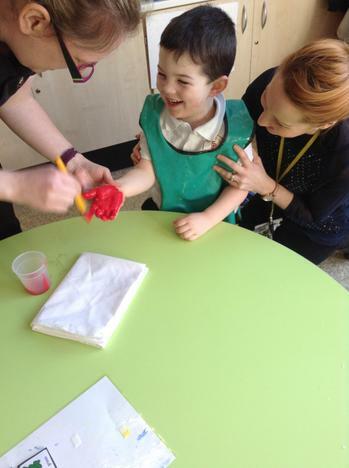 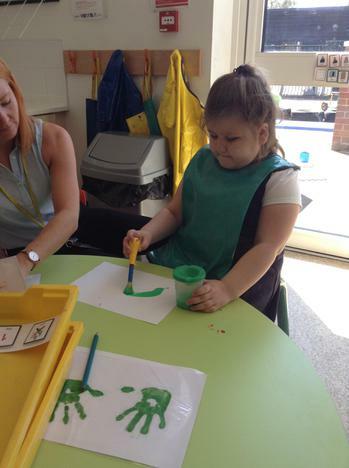 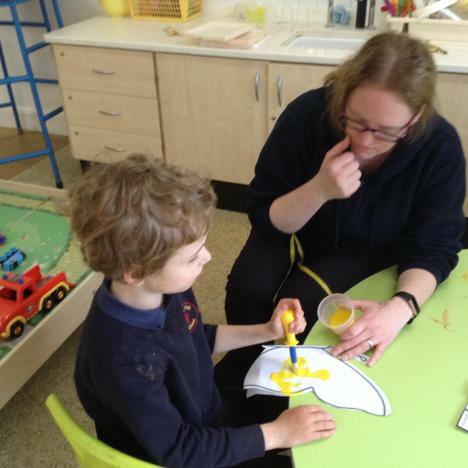 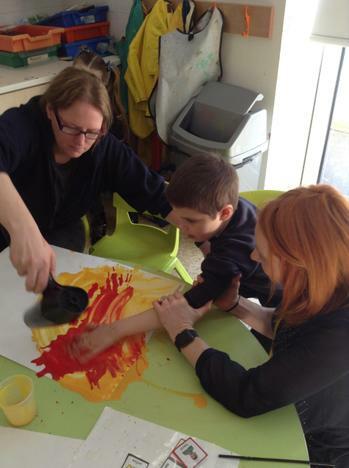 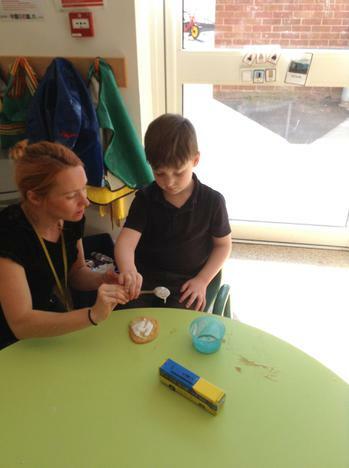 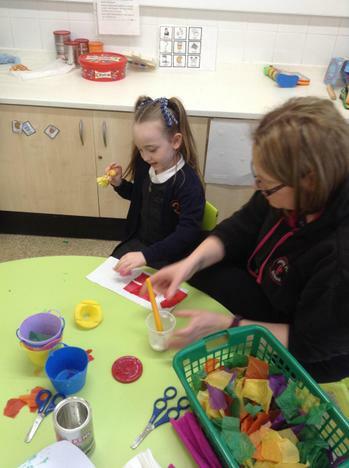 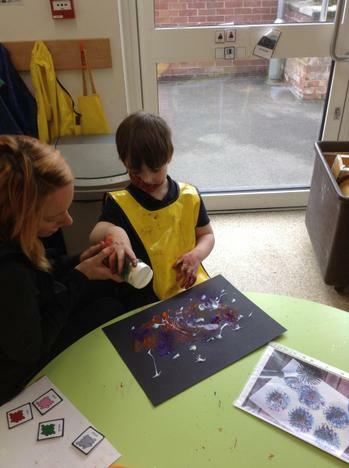 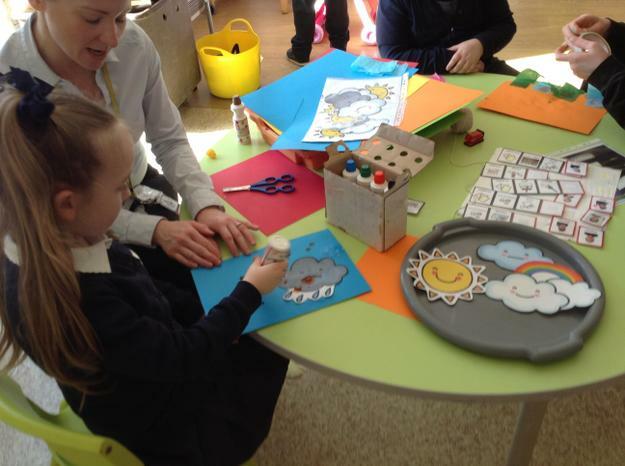 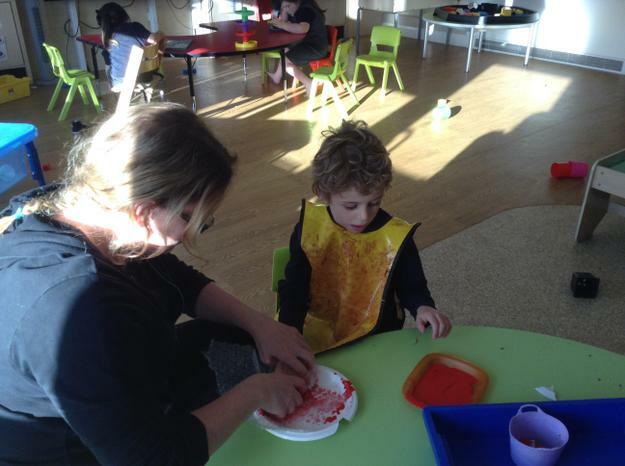 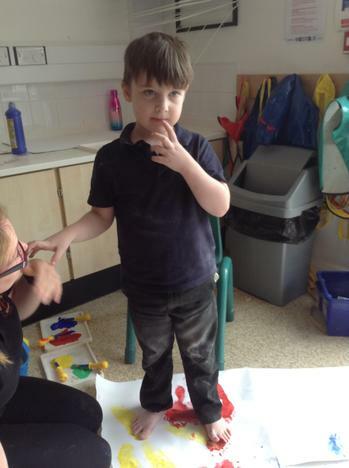 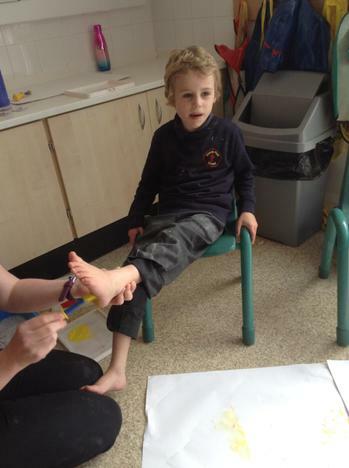 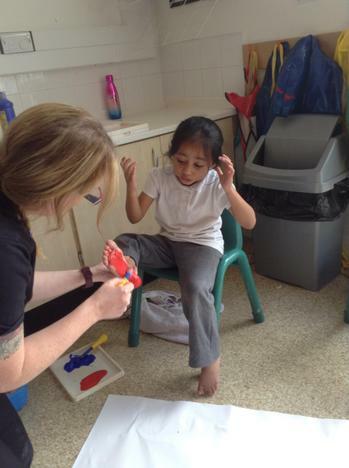 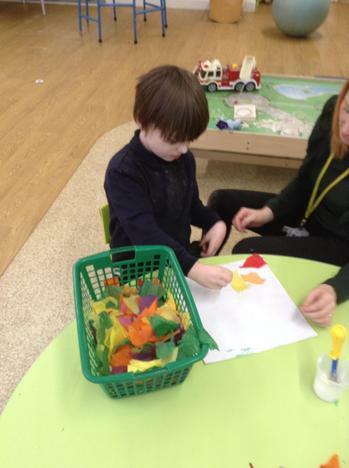 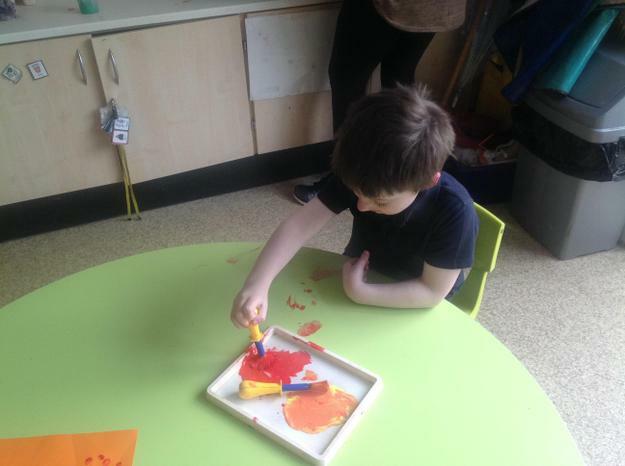 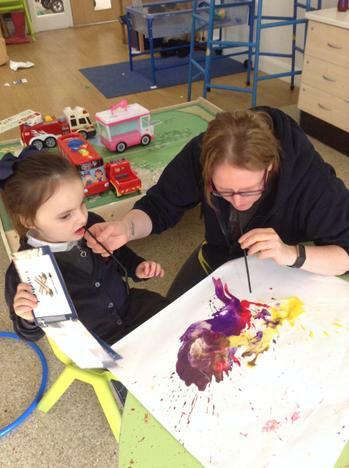 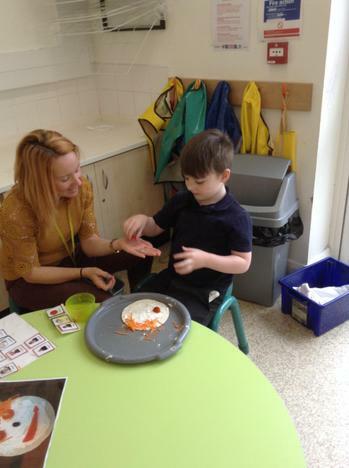 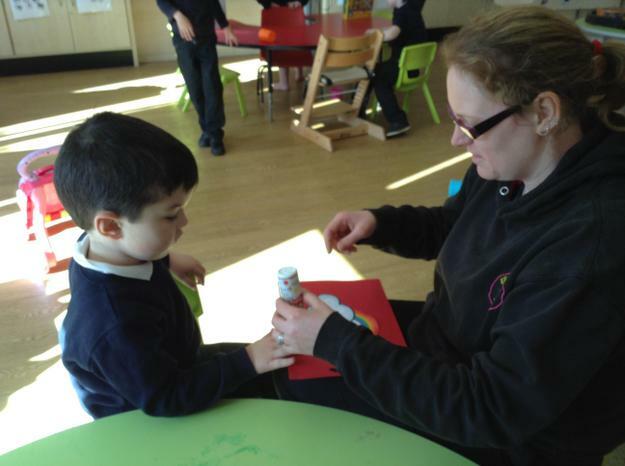 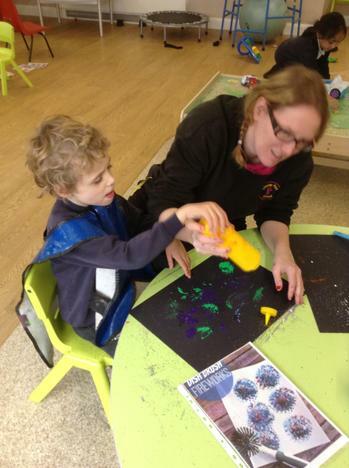 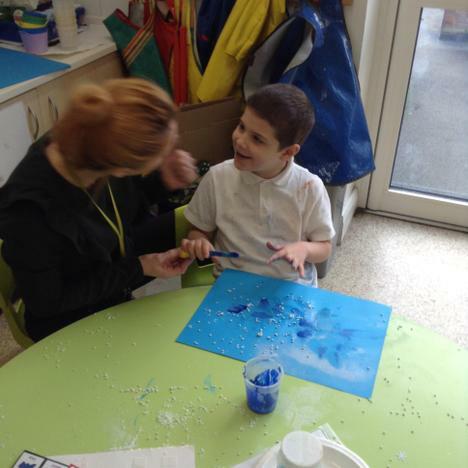 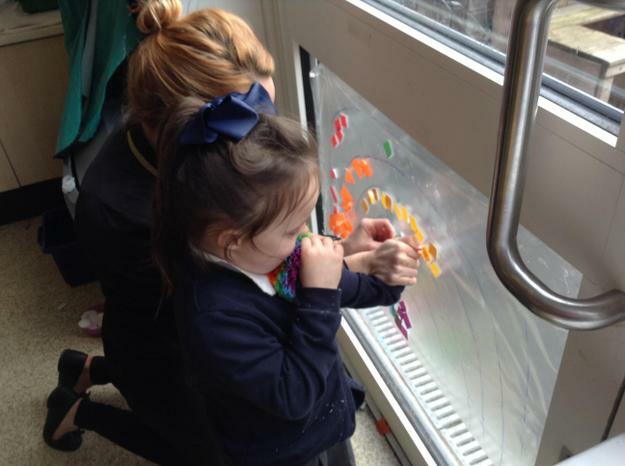 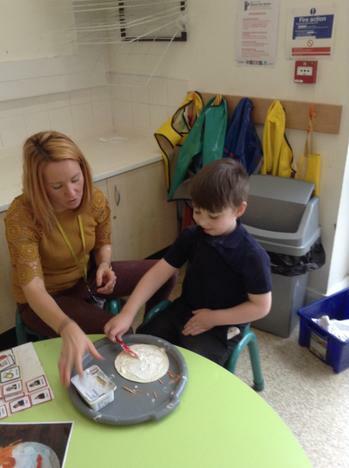 The children have been busy this term expressing their artistic and creative sides through a range of sensory process based art activities. 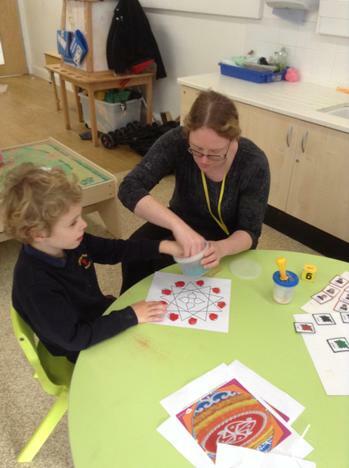 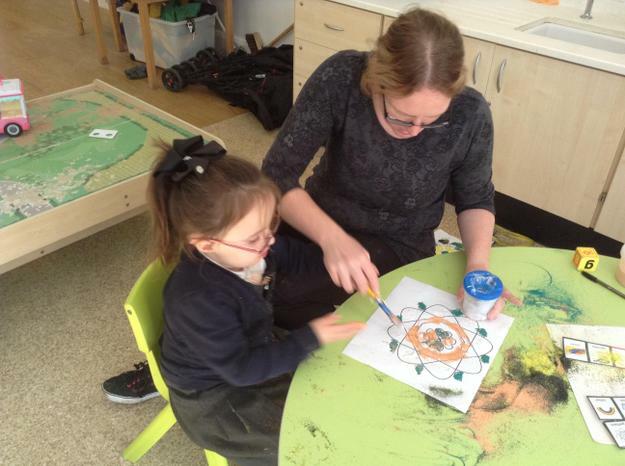 We used paint to create symmetrical butterfly pictures when learning about the hungry caterpillar story. 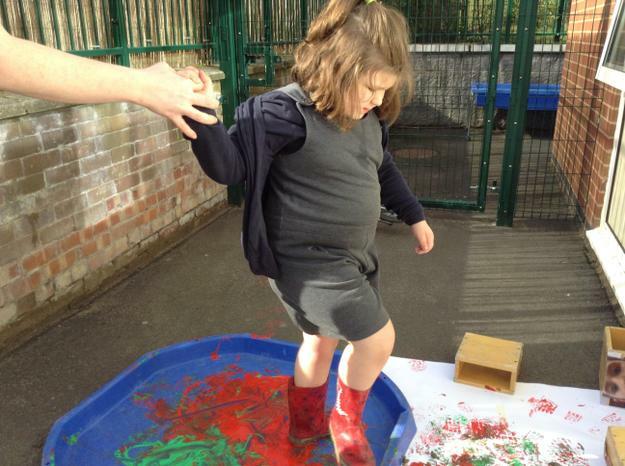 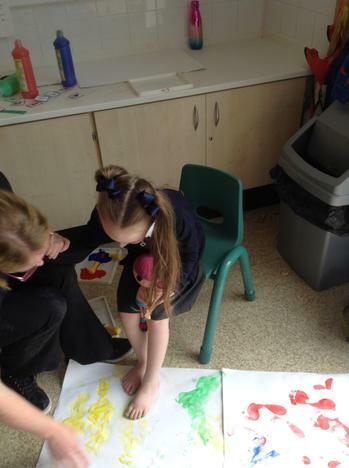 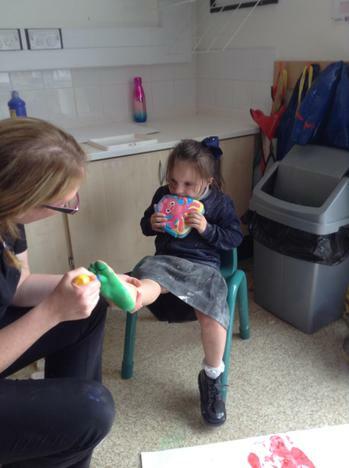 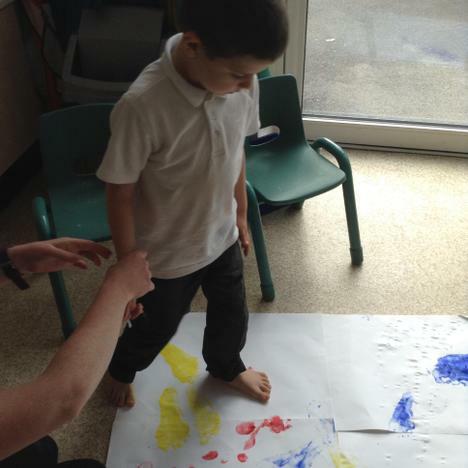 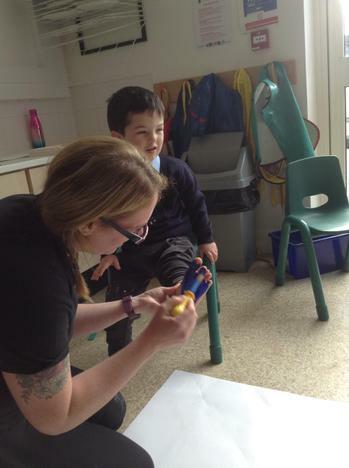 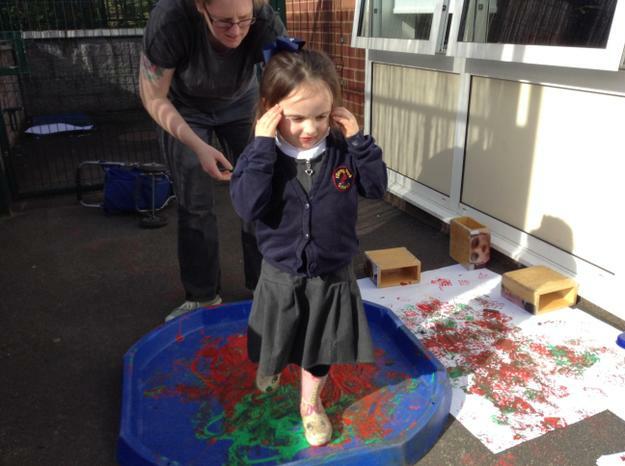 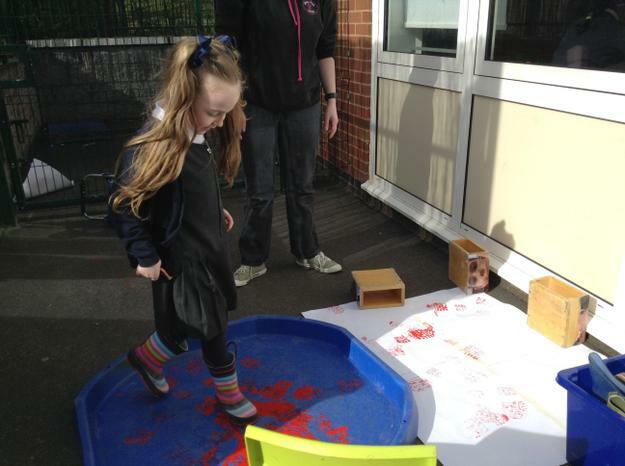 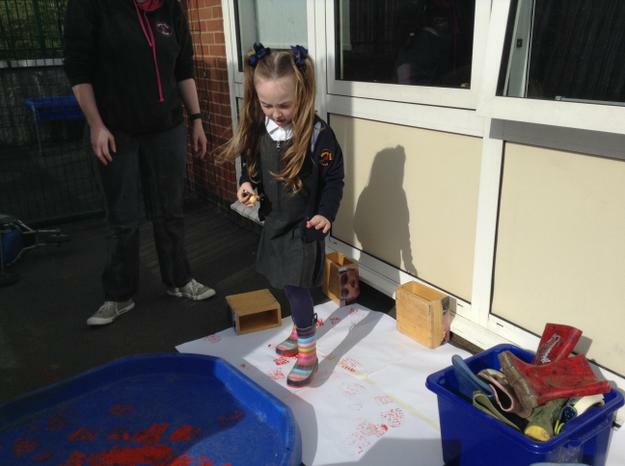 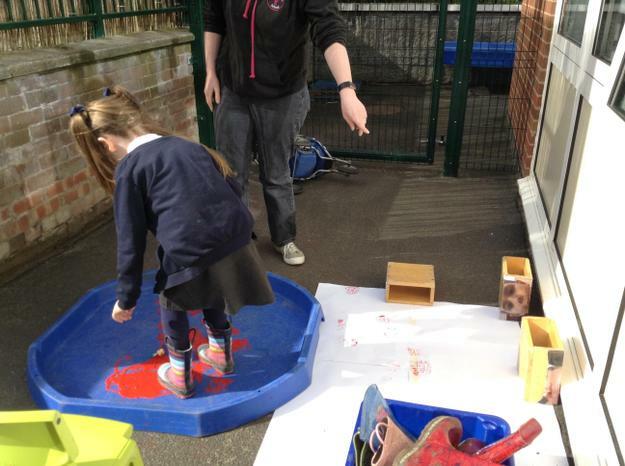 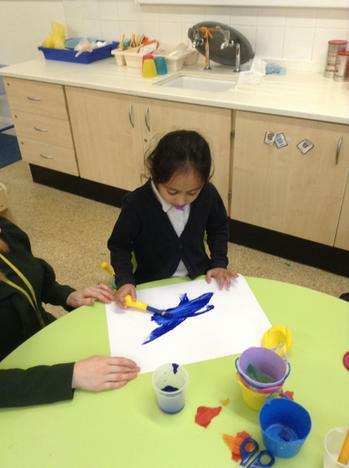 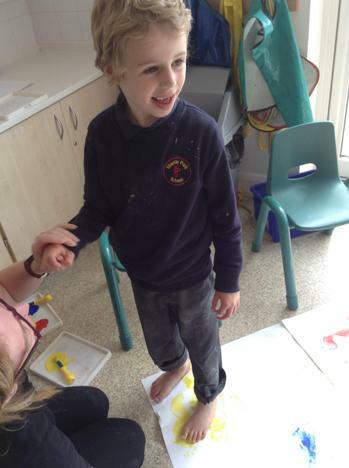 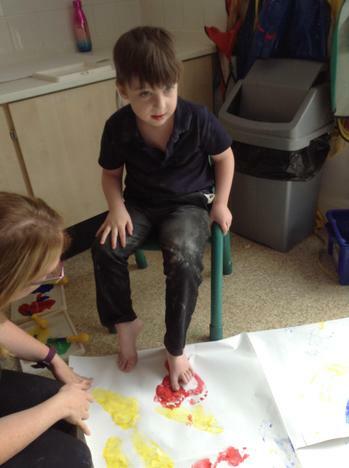 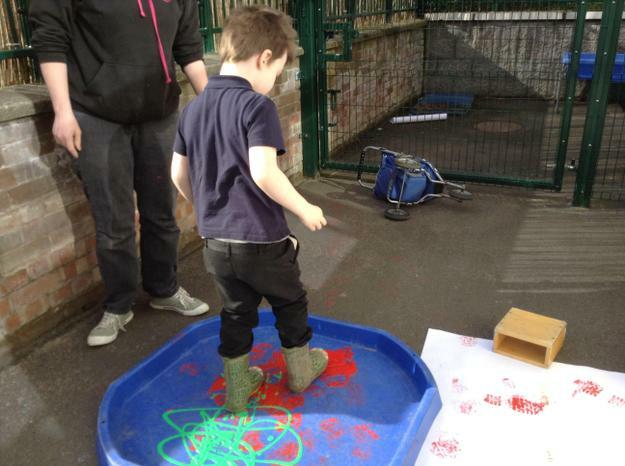 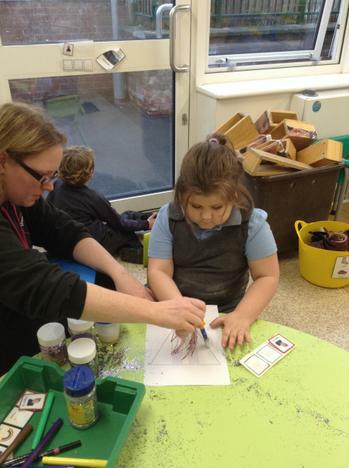 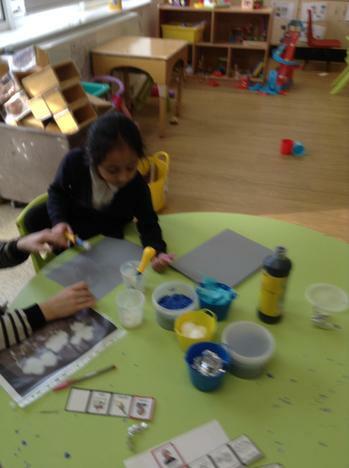 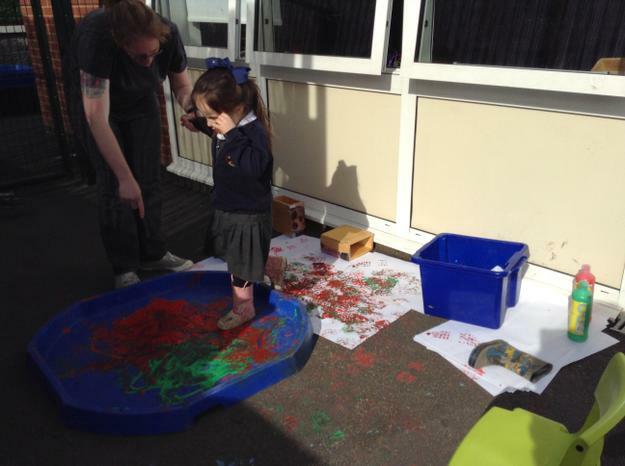 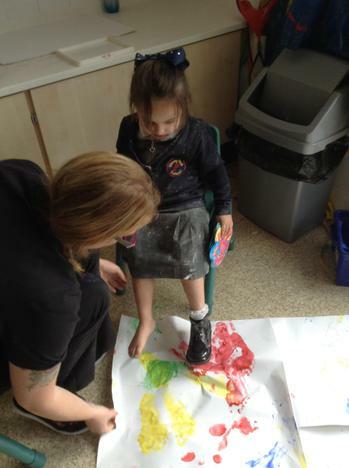 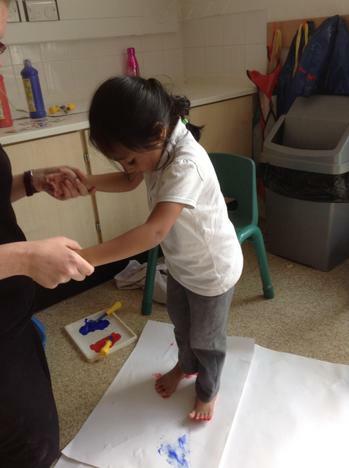 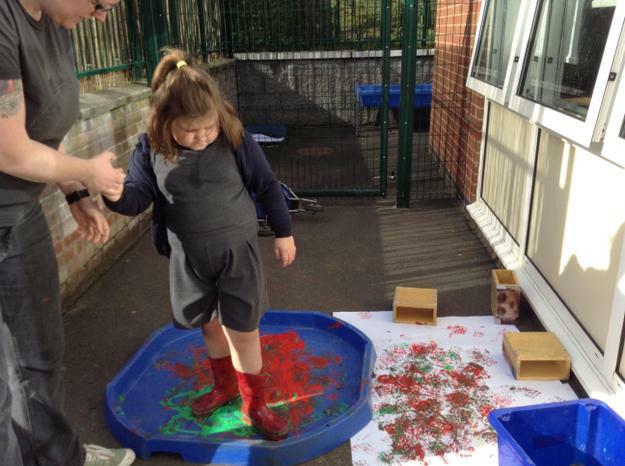 We also enjoyed wearing our welly boots to stomp through paint outside to make marks. 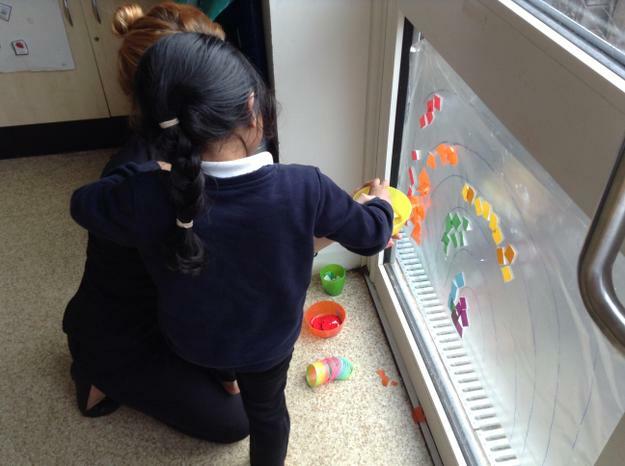 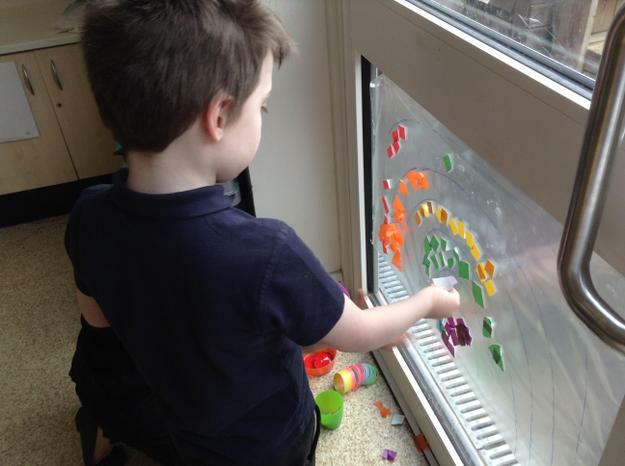 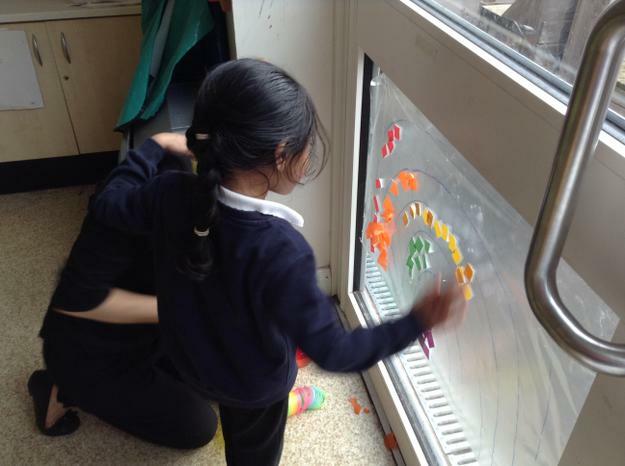 We also created a whole class sticky rainbow using bits of coloured paper that is displayed on our classroom door. 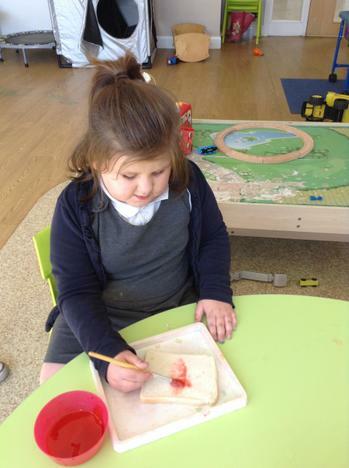 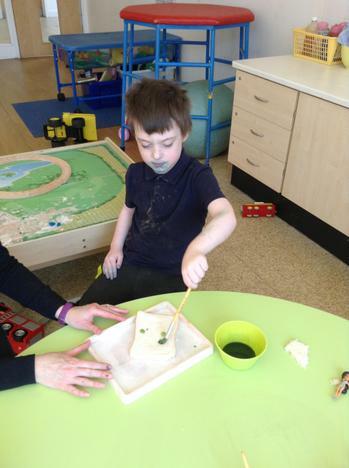 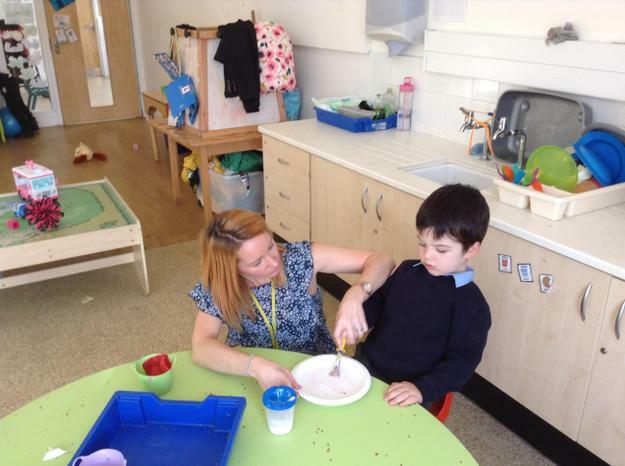 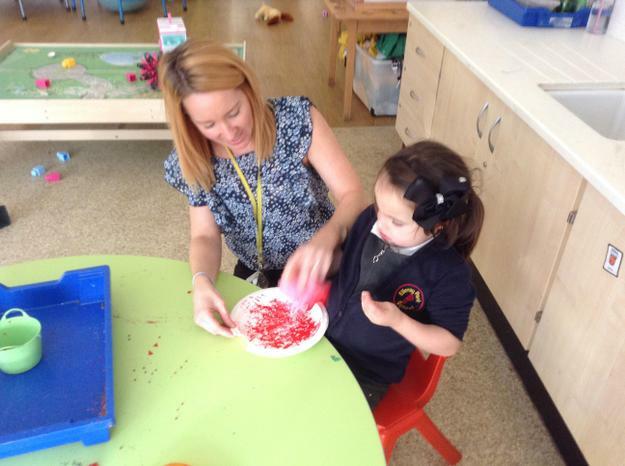 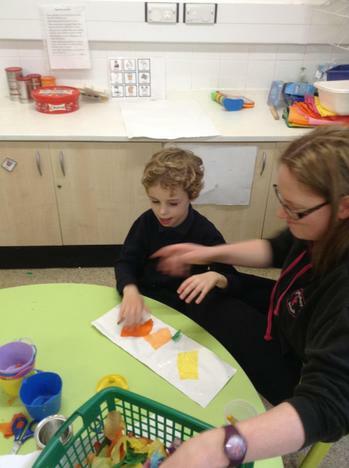 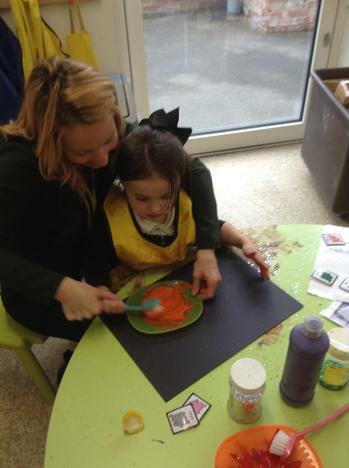 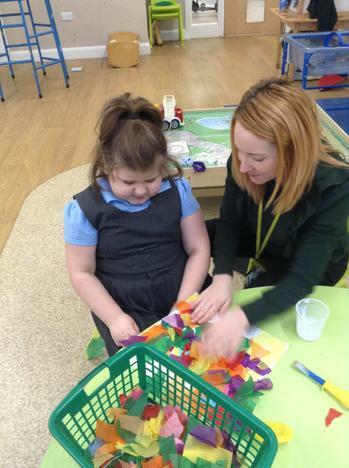 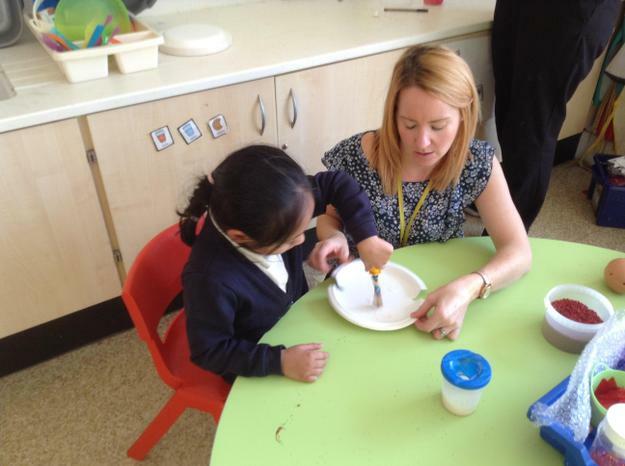 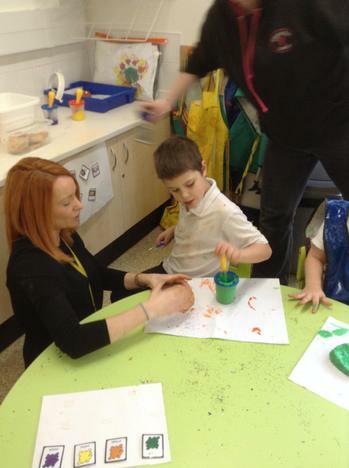 We all enjoyed making rainbow bread using tasty edible icing. 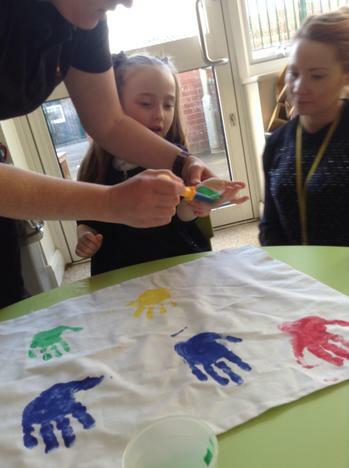 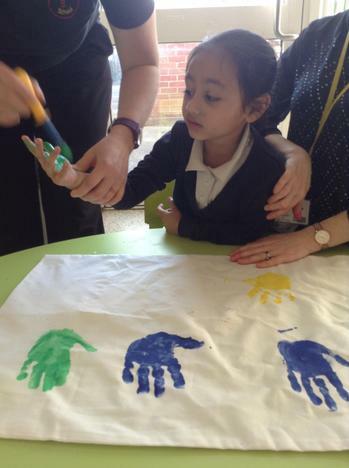 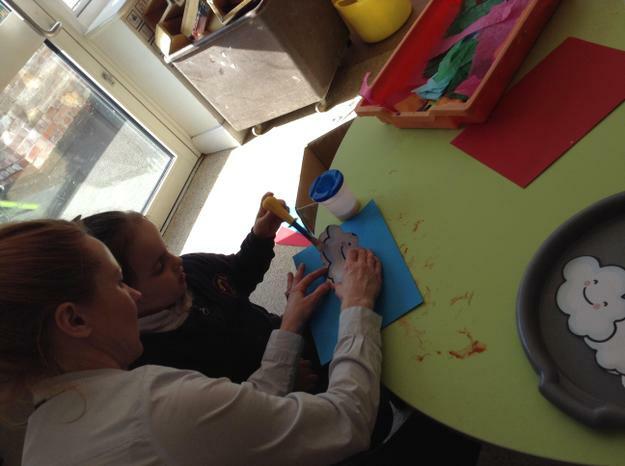 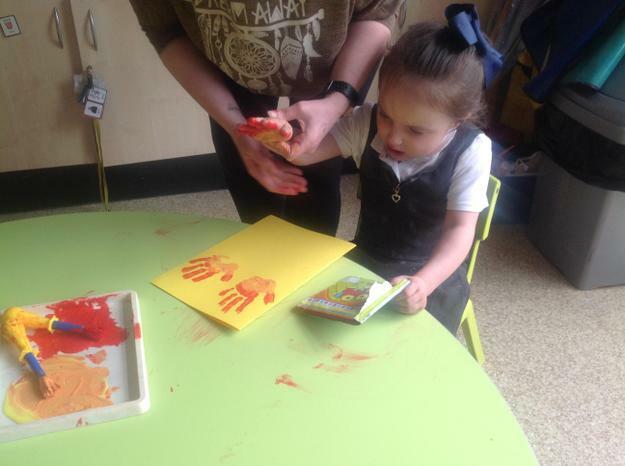 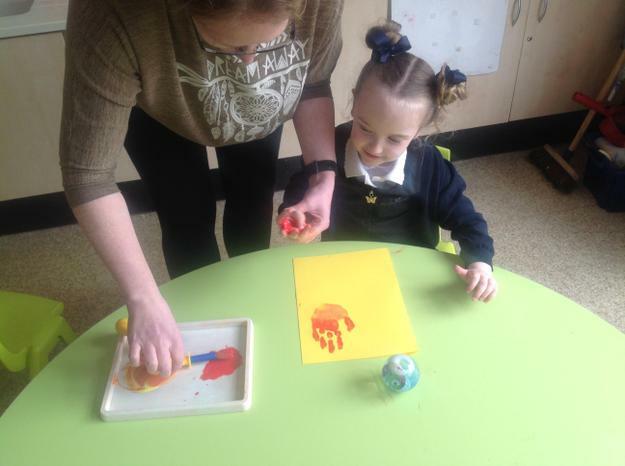 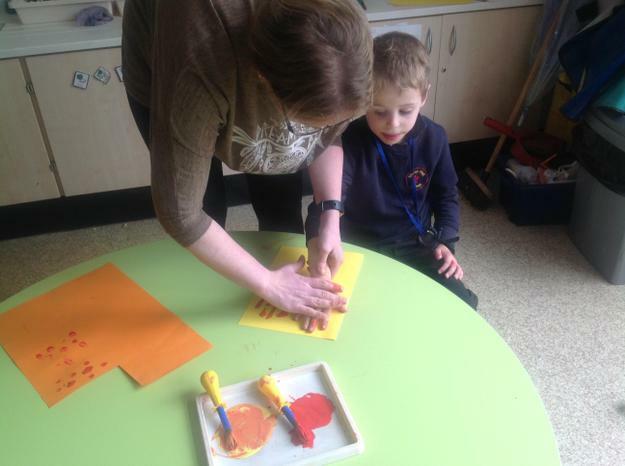 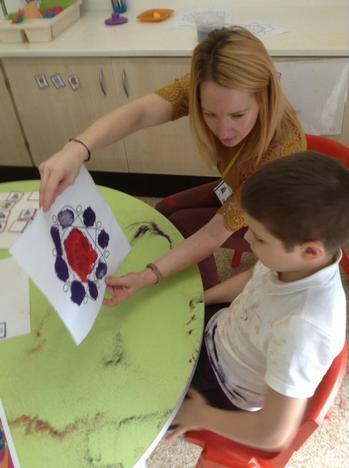 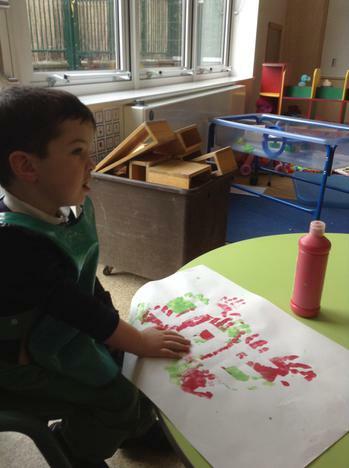 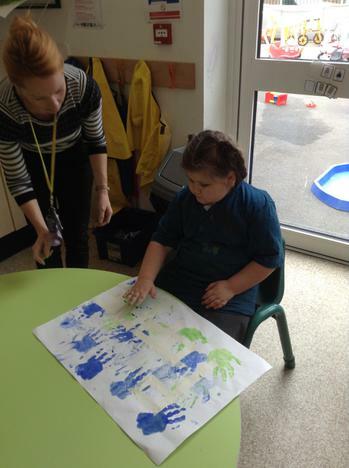 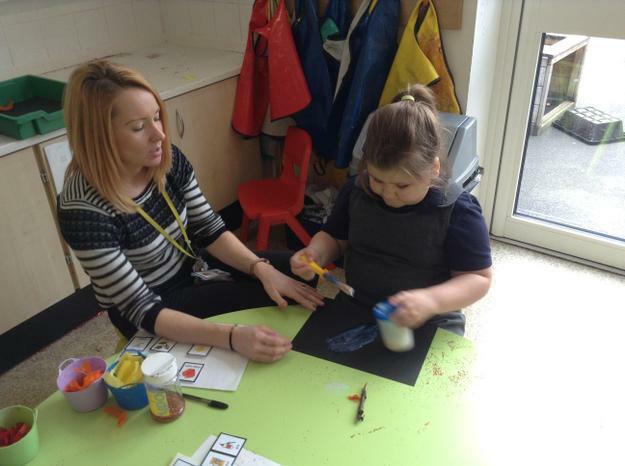 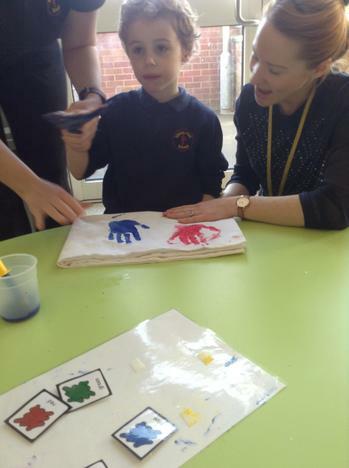 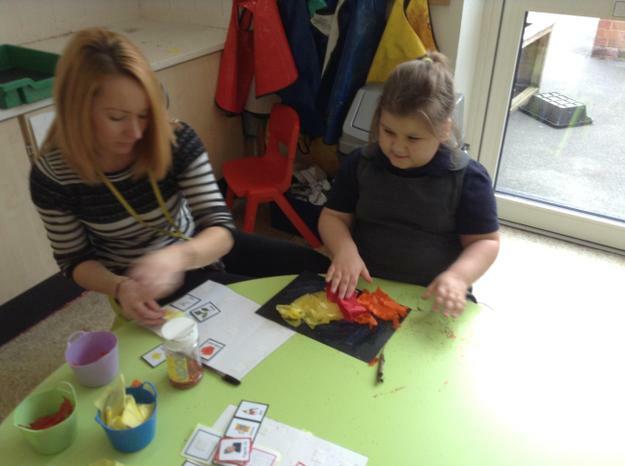 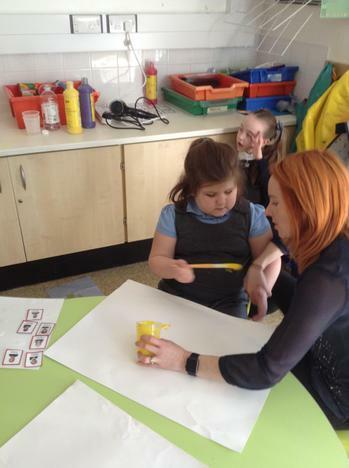 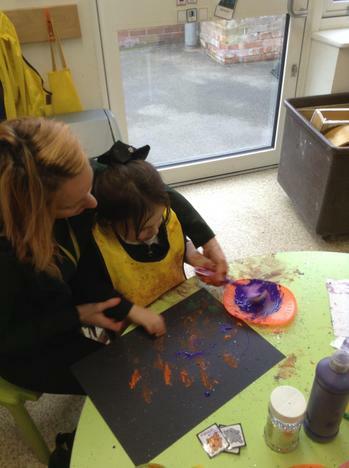 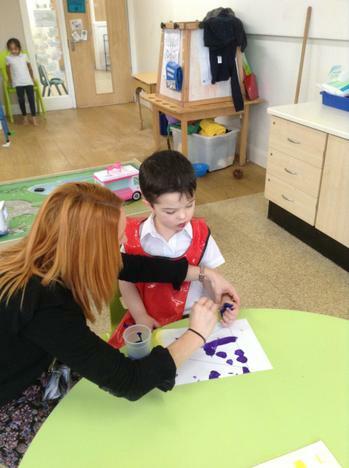 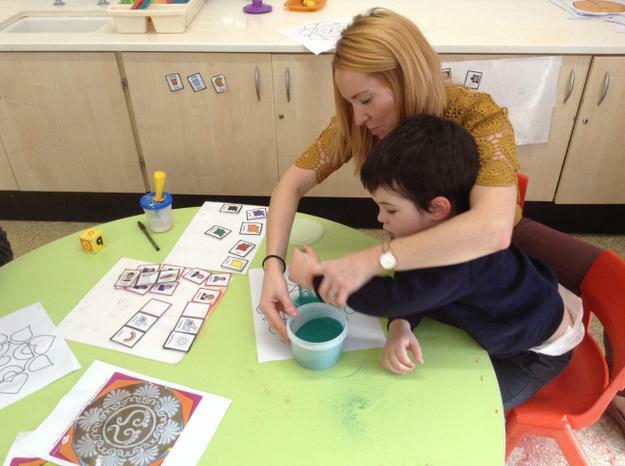 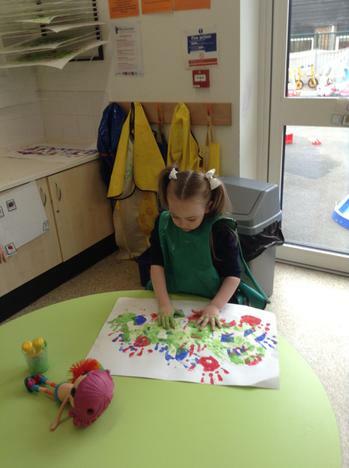 Finally, we made a very special card for our lovely mums on mothers day using our hand prints. 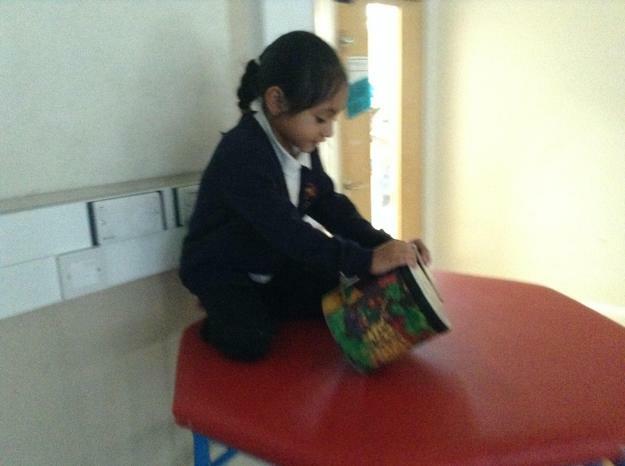 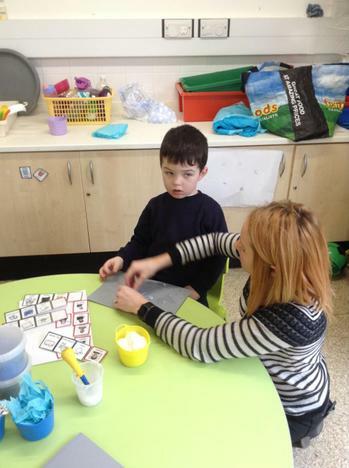 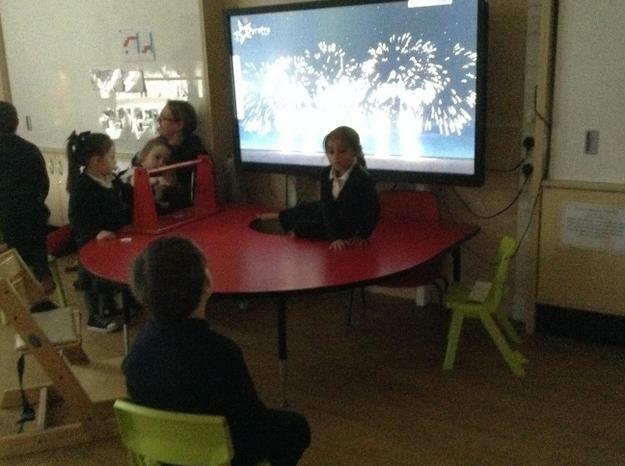 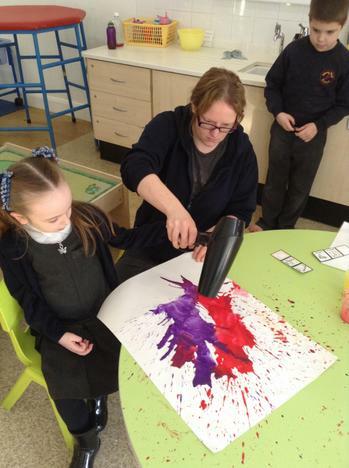 Lime class love to get creative. 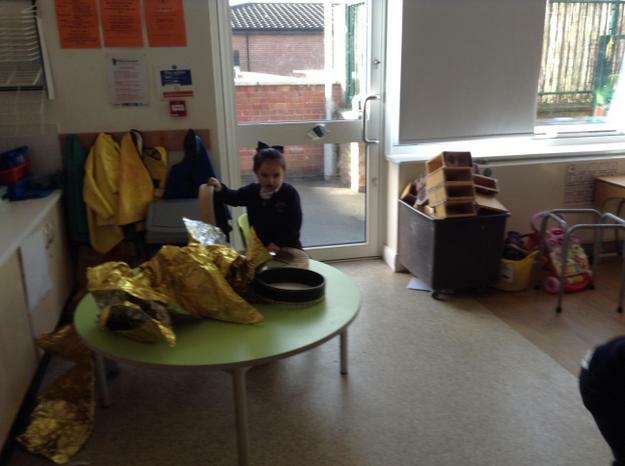 We started the year by making our enterprise items to sell. 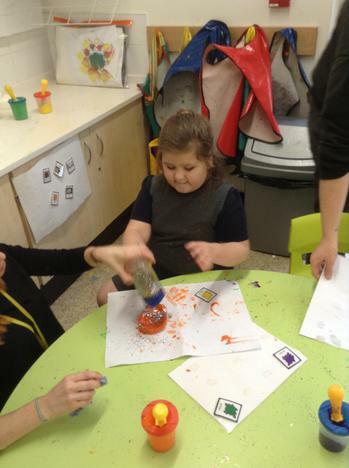 We used old coffee containers to make beautiful storage jars and money tins, decorating them with tissue paper and paint. 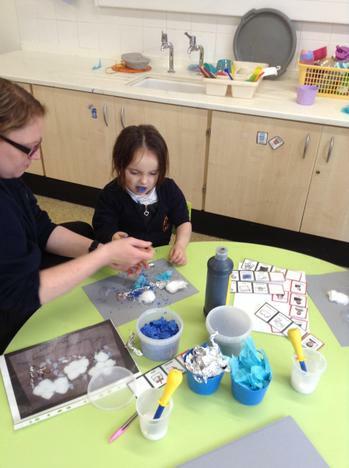 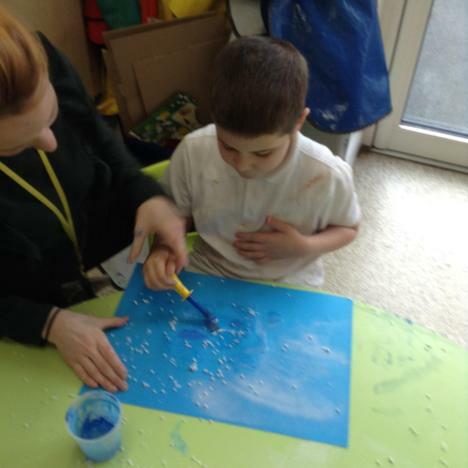 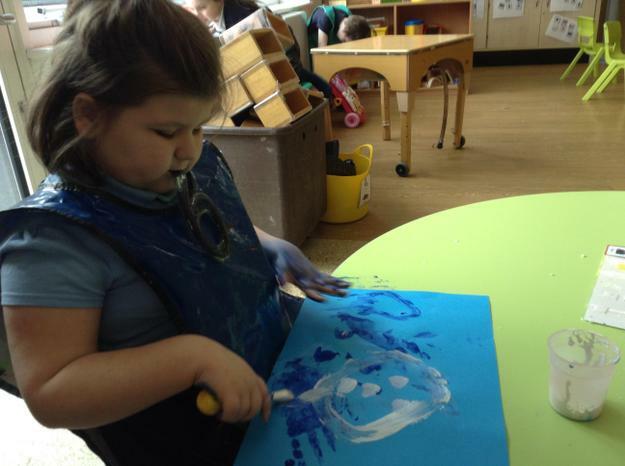 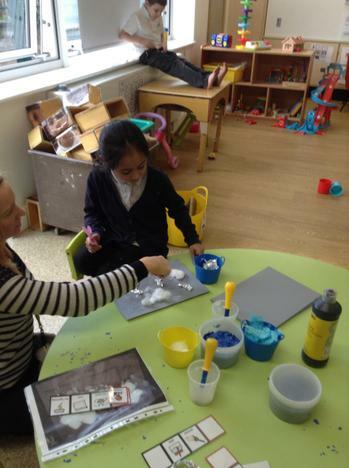 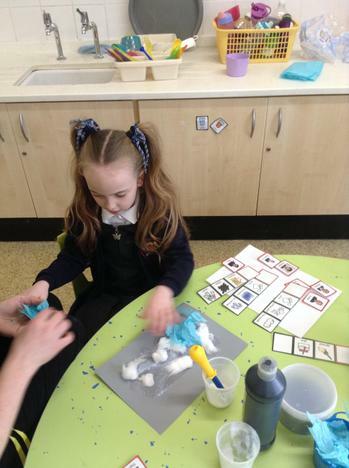 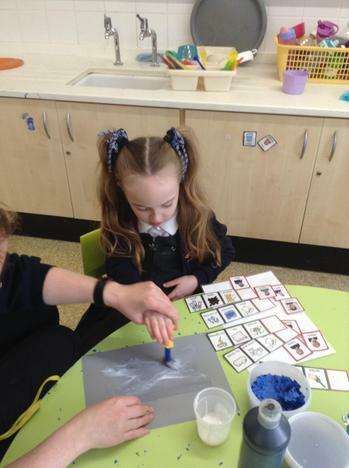 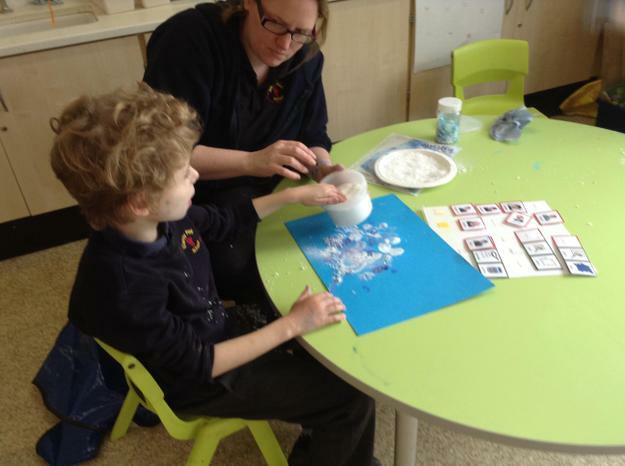 During our weather topic we have also made some lovely winter frost pictures using white and blue paint, fake snow and icy glitter. 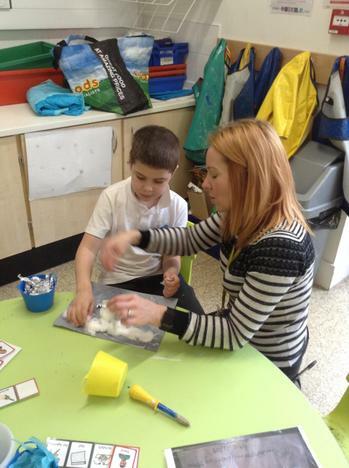 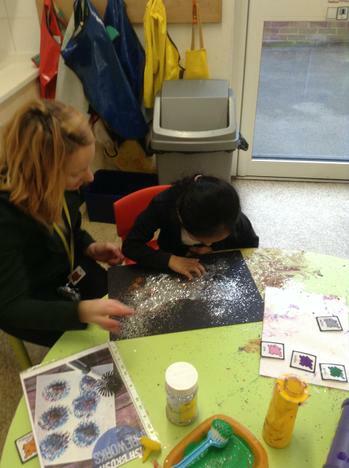 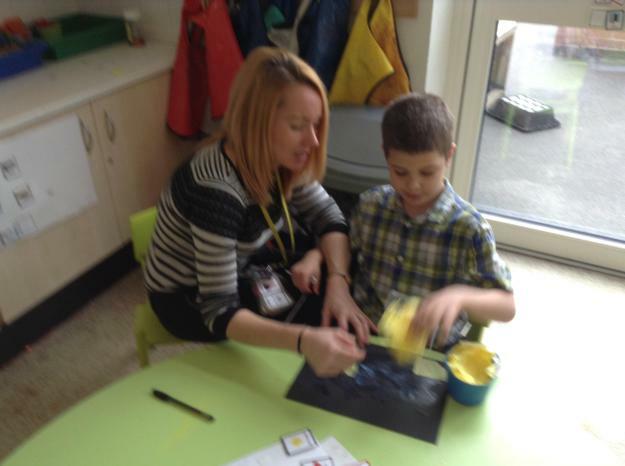 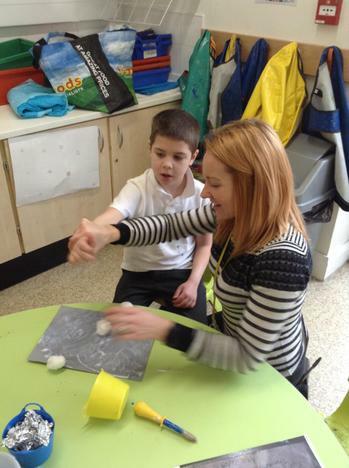 We also used grey card, cotton wool, tin foil and powder paint to create a thunderstorm picture. 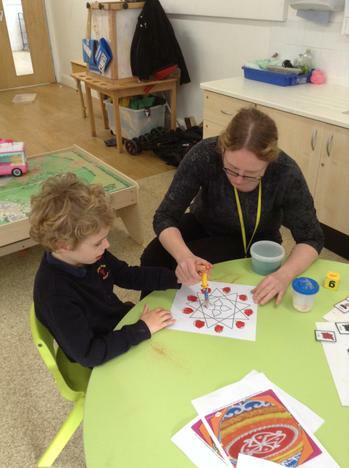 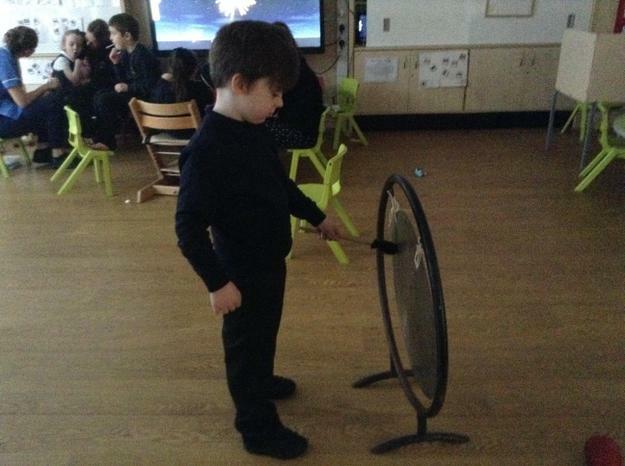 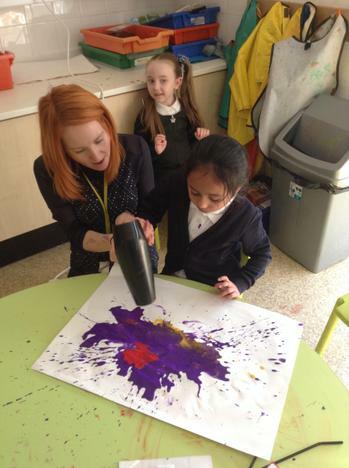 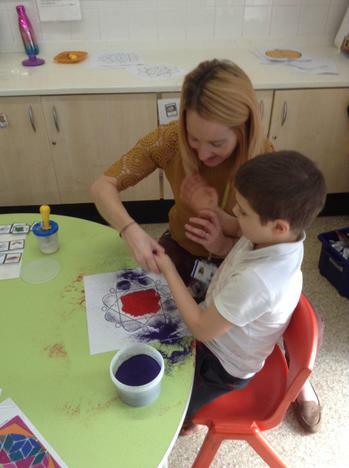 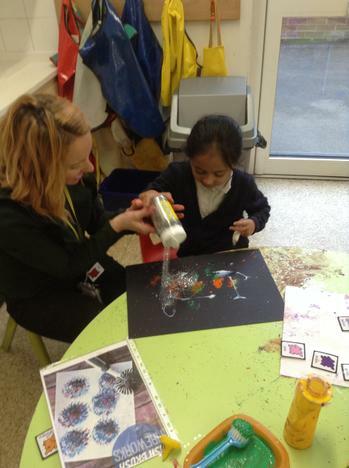 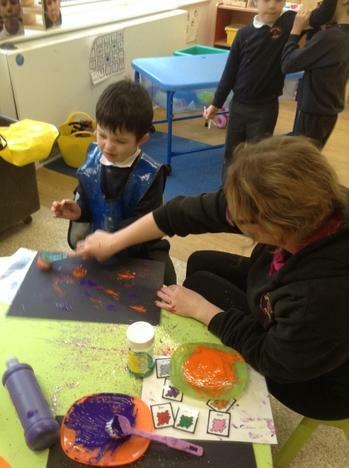 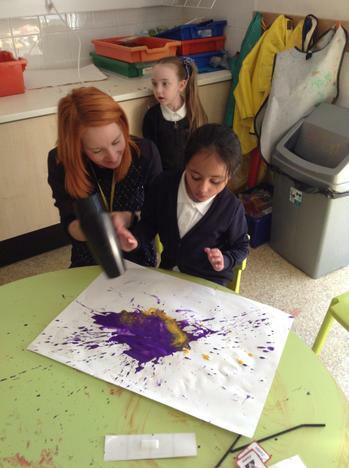 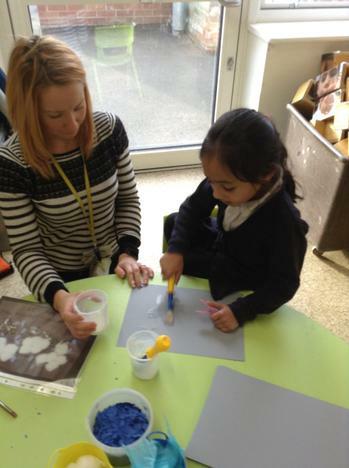 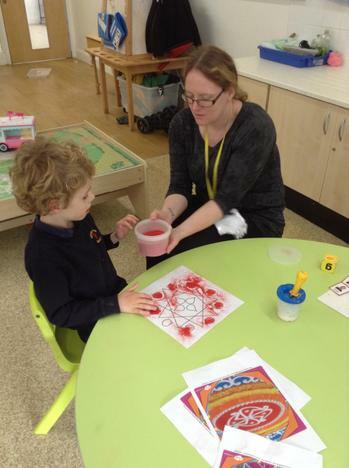 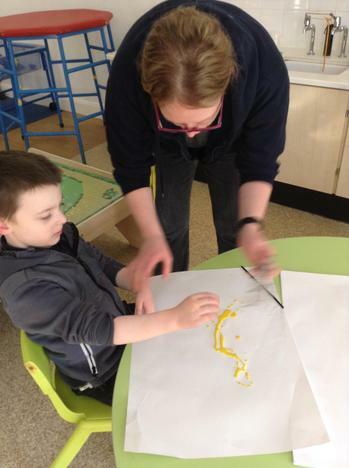 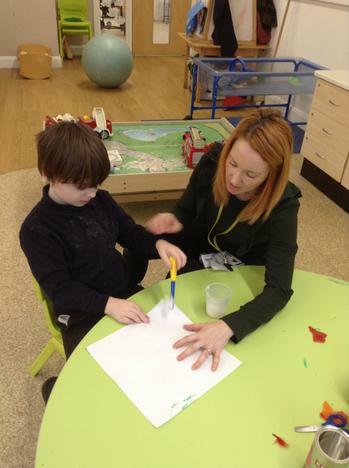 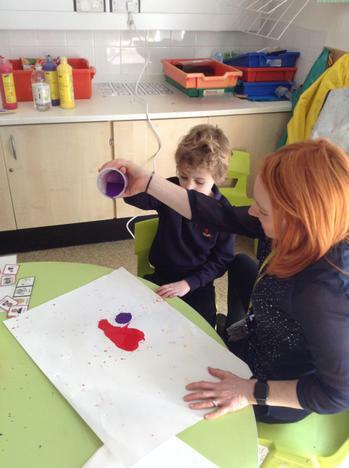 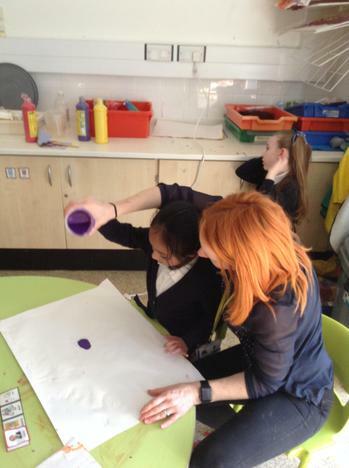 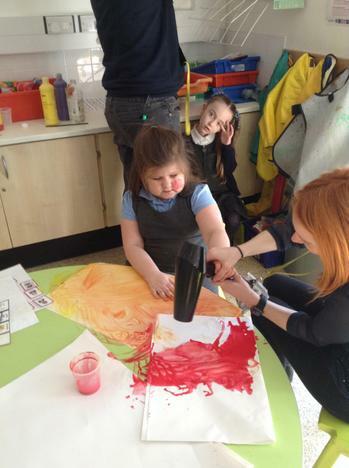 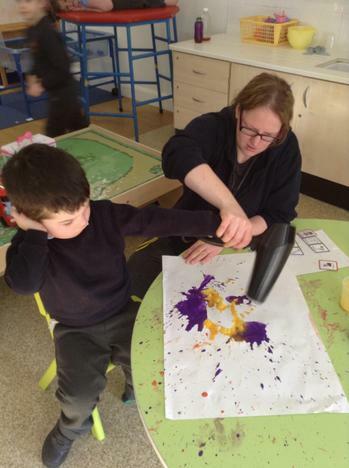 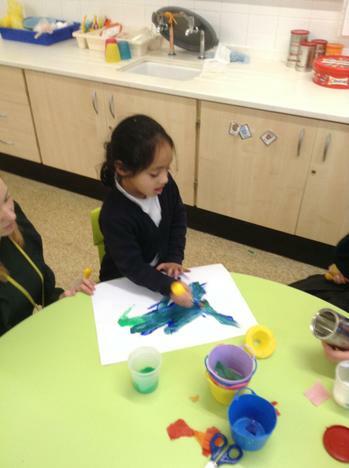 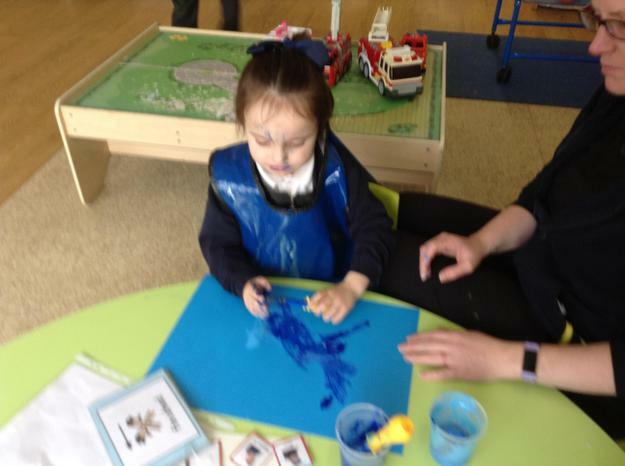 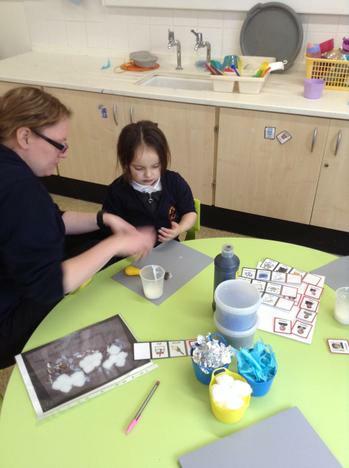 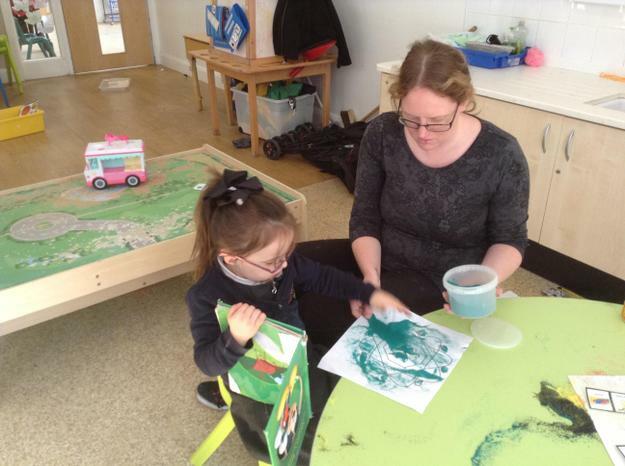 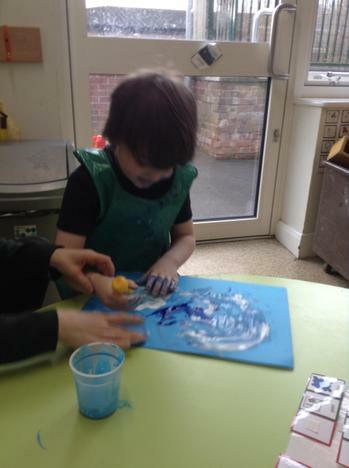 We also enjoyed exploring the effects of wind on paint using straws and hairdryers to blow the paint across the paper. 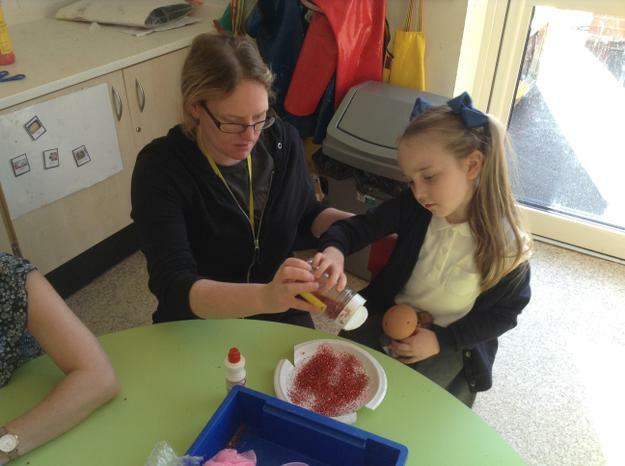 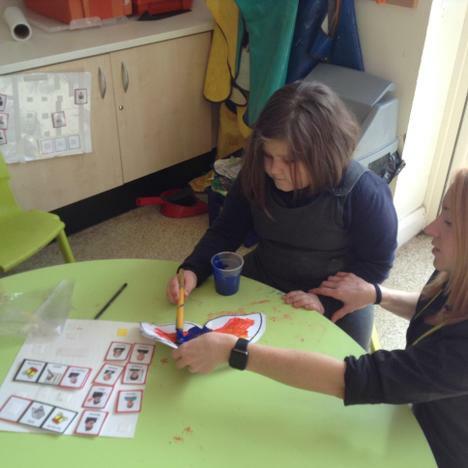 We have really enjoyed getting creative during our 'Celebrations' topic and have used a range of tools and materials to create different effects and artwork. 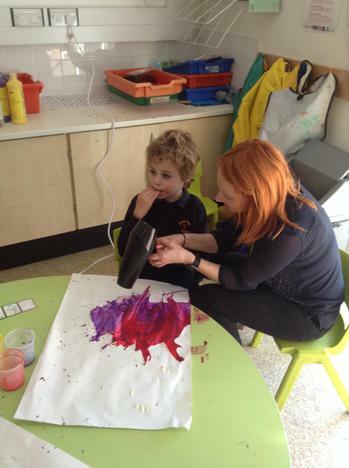 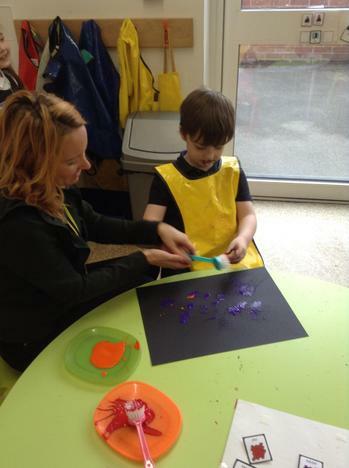 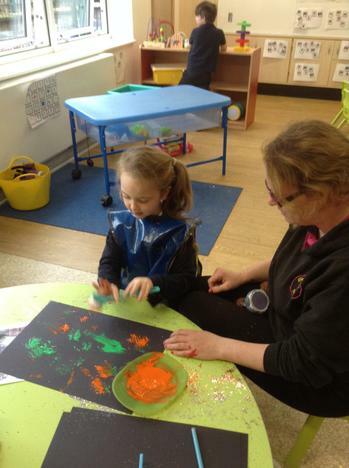 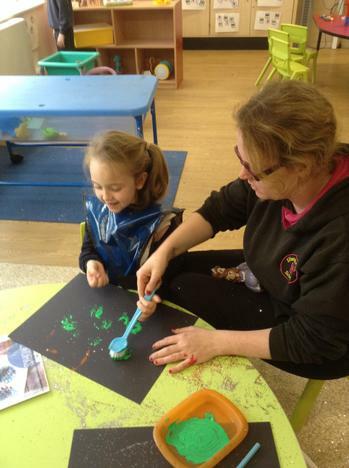 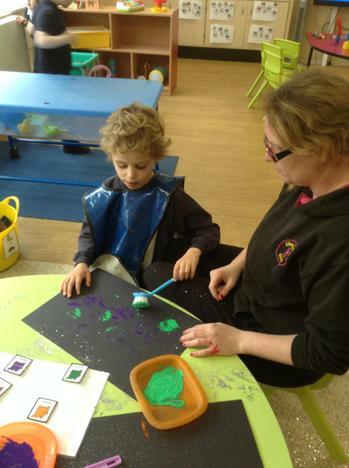 This has included using dish brushes and paint to create 'splatter effect' firework pictures. 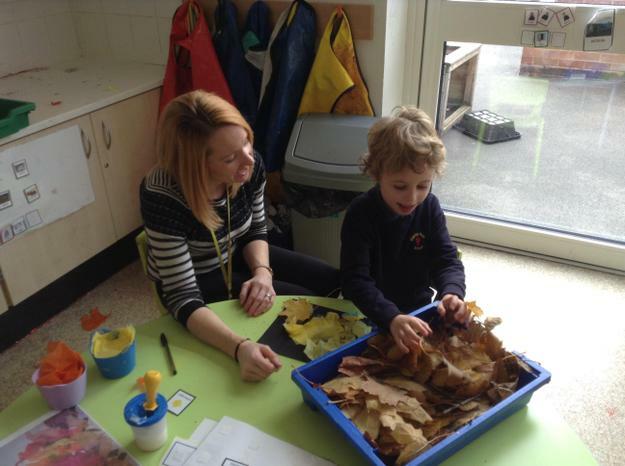 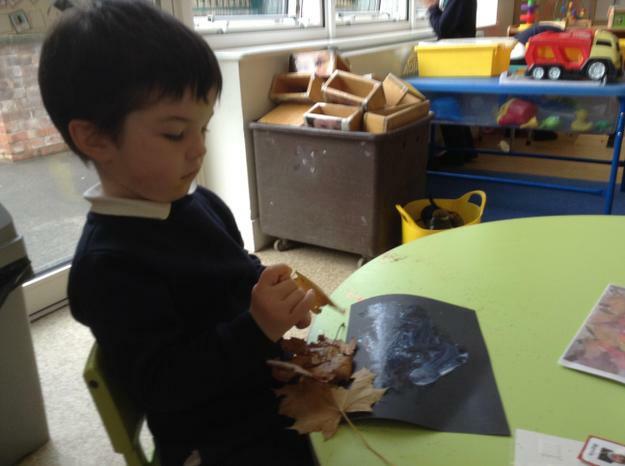 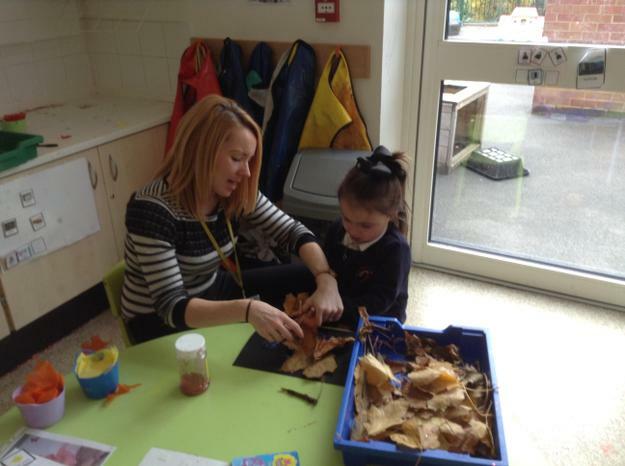 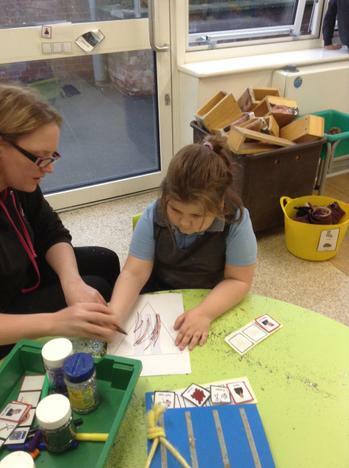 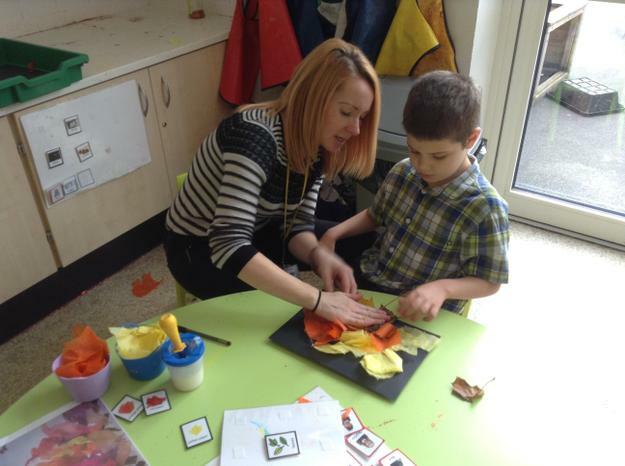 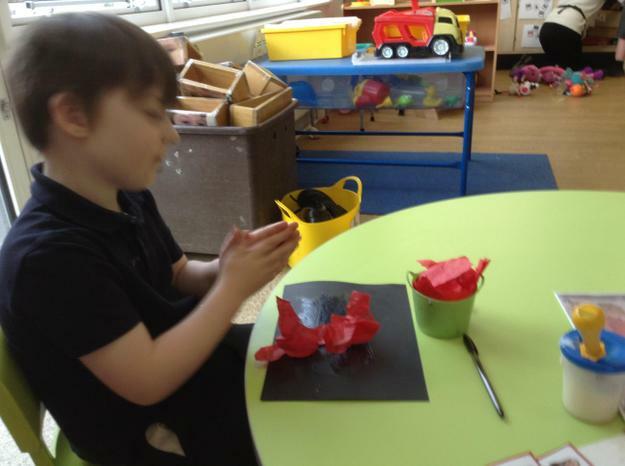 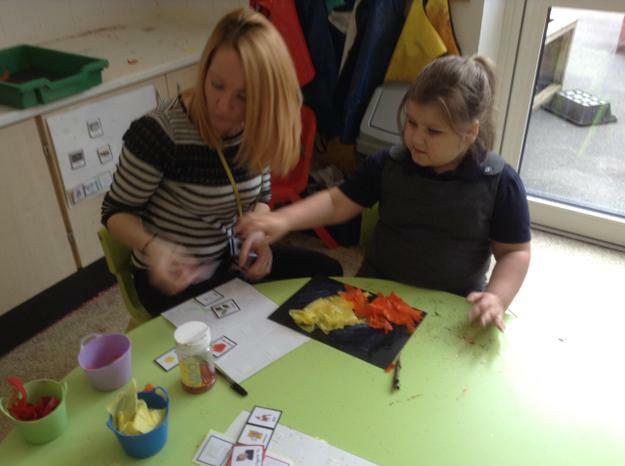 We also explored the texture of different materials to make a bonfire picture such as twigs, leaves and tissue paper. 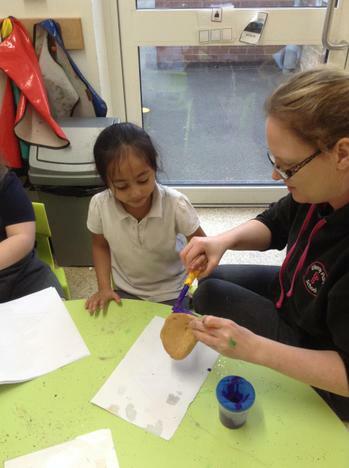 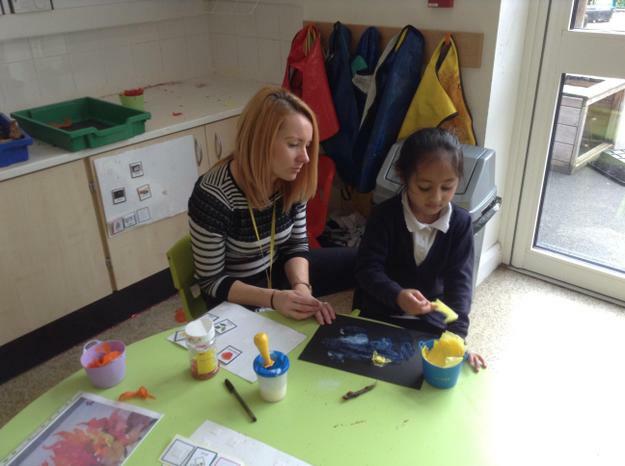 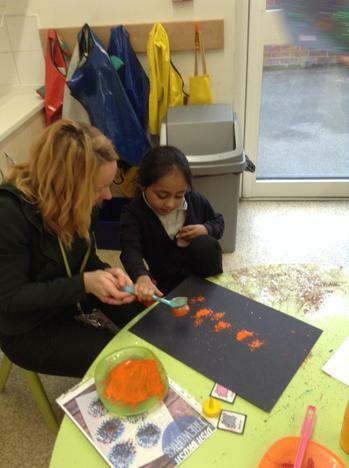 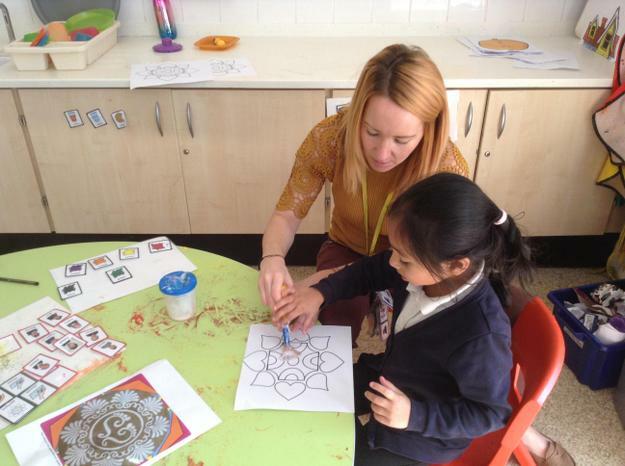 When we were learning about the Hindu festival of Diwali we used salt dough to make Diva Lamps and then decorated them with bright paint and glitter. 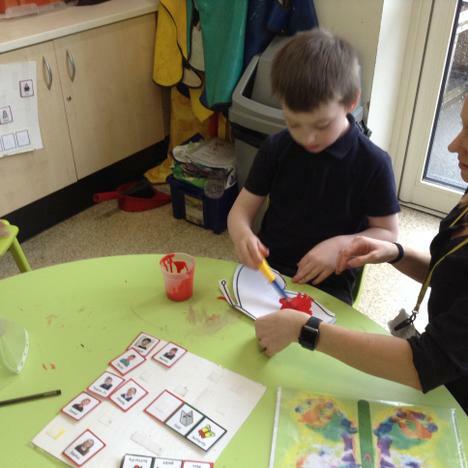 We also made some Birthday bunting when we learnt about Birthdays, using paint, felt tip pens, glitter and stampers to make it look colourful when we hung it up for our party. 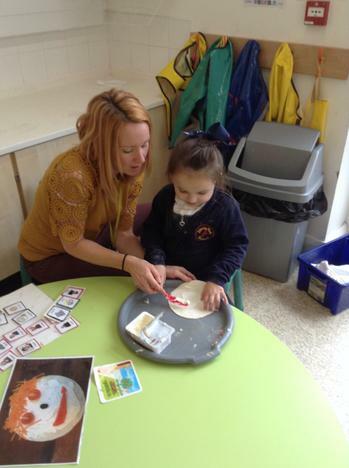 We also enjoyed decorating cakes and biscuits for the Macmillan coffee morning in cookery. 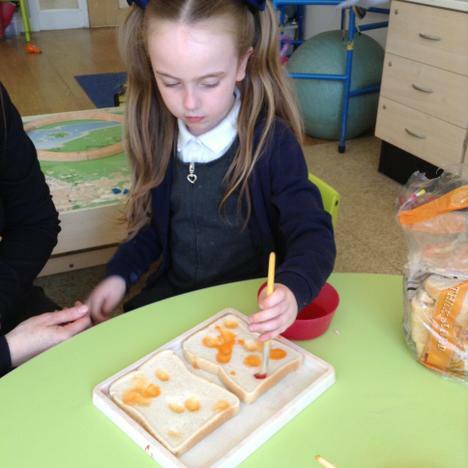 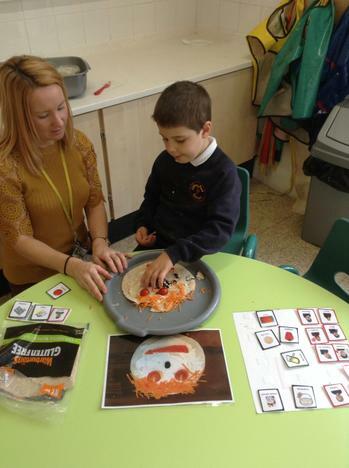 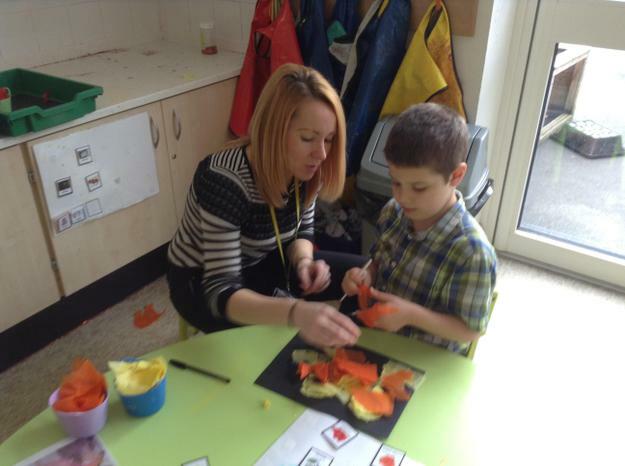 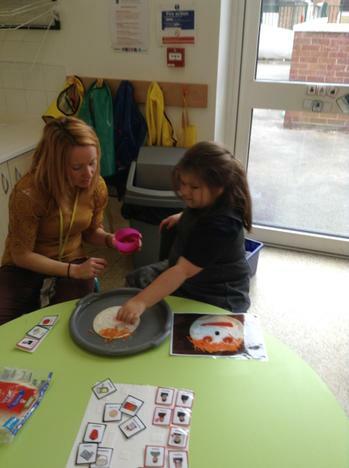 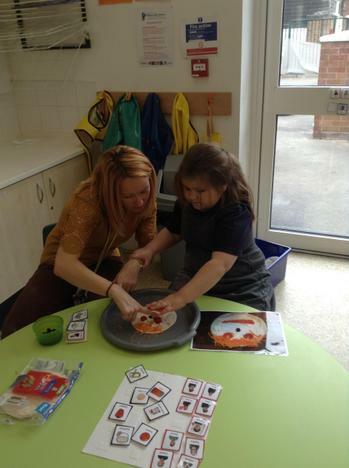 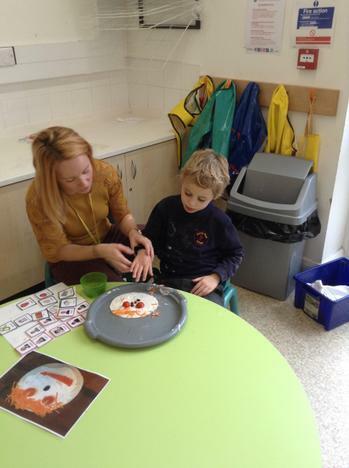 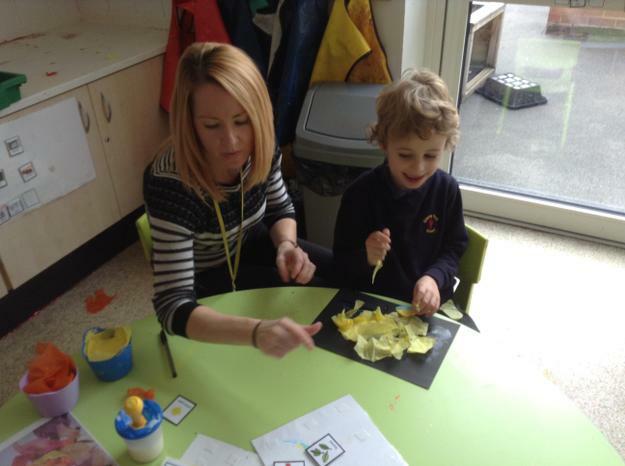 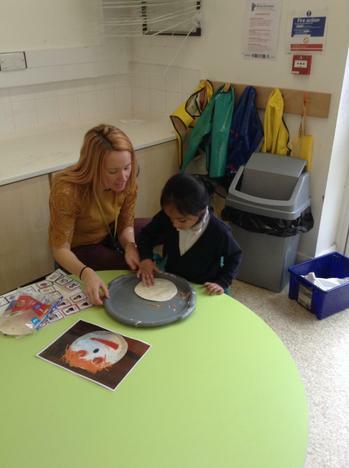 We all enjoyed making face pizzas using wraps and different fruit and vegetables. 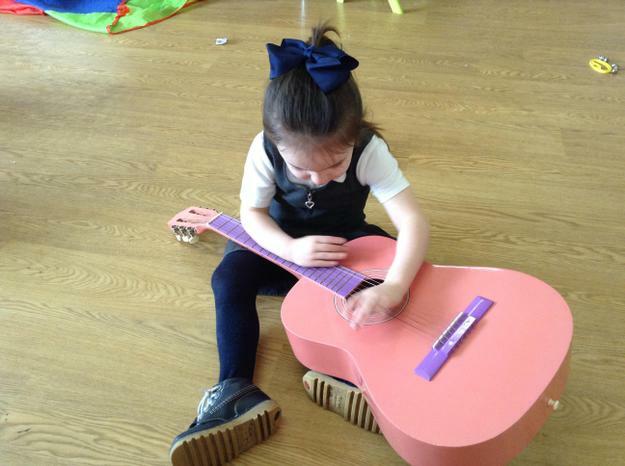 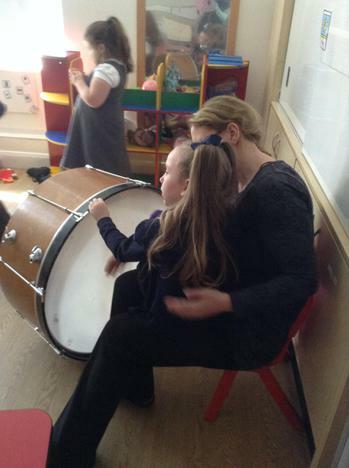 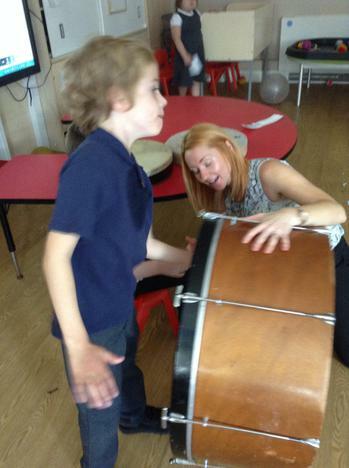 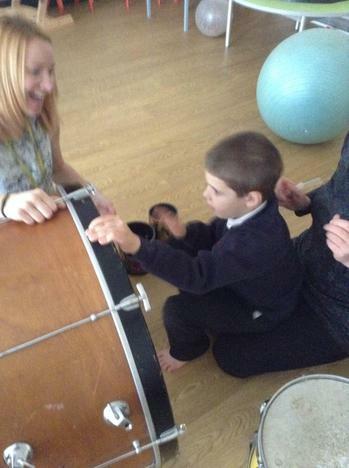 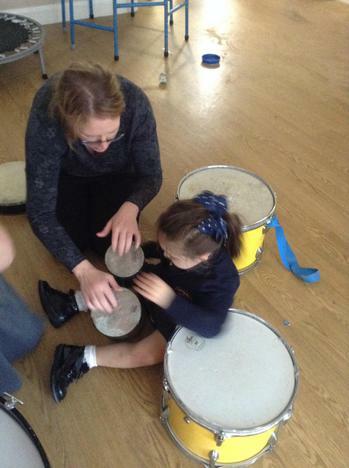 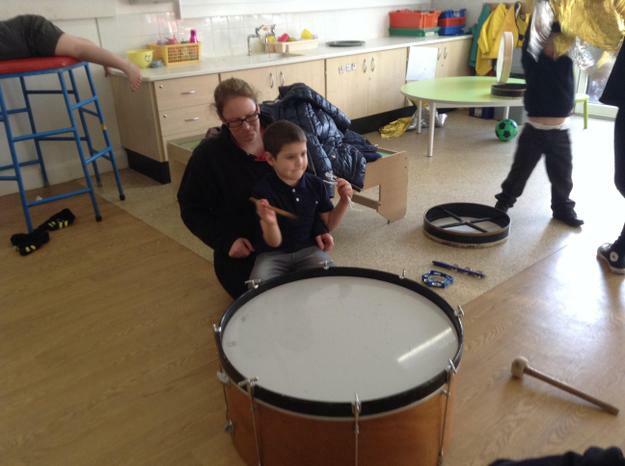 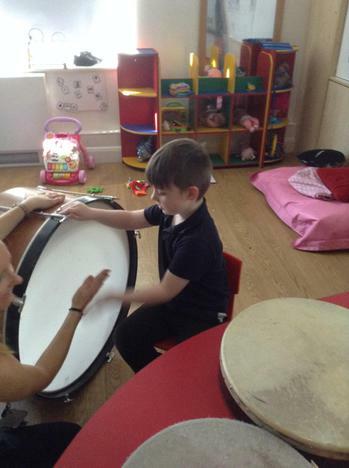 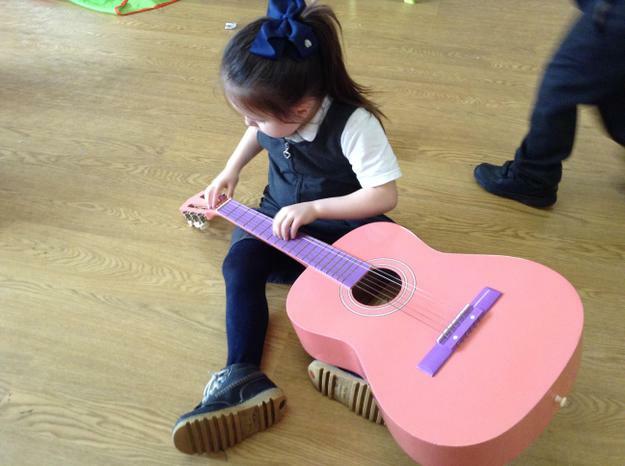 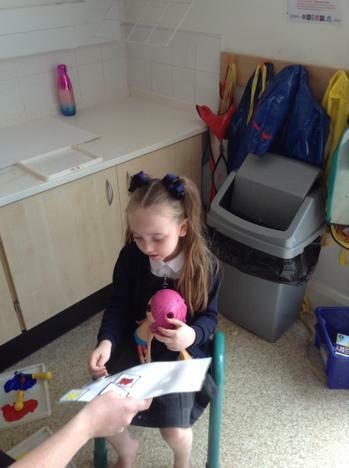 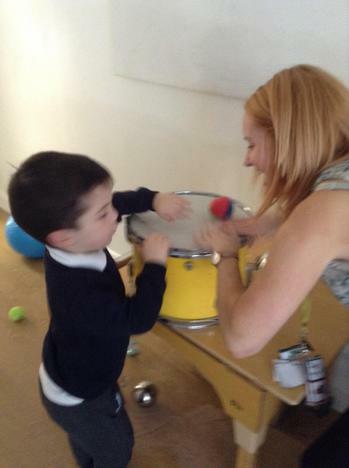 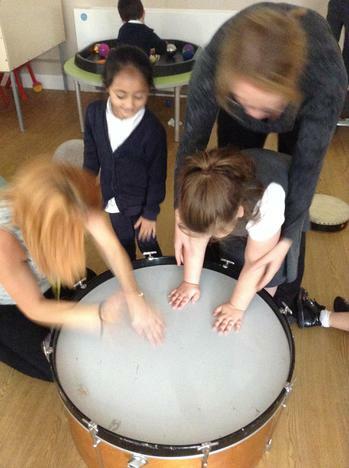 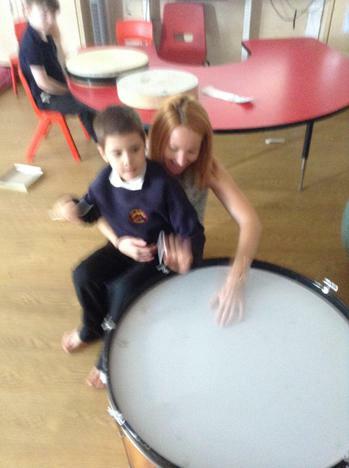 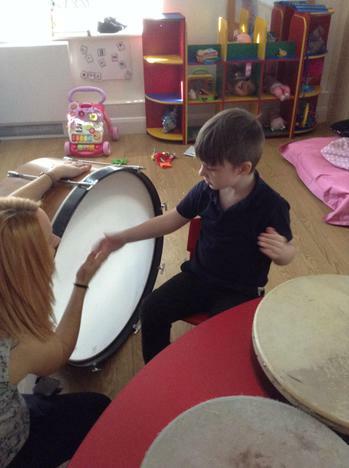 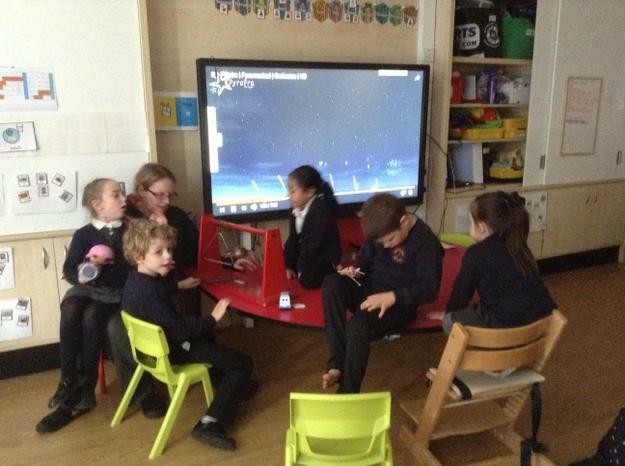 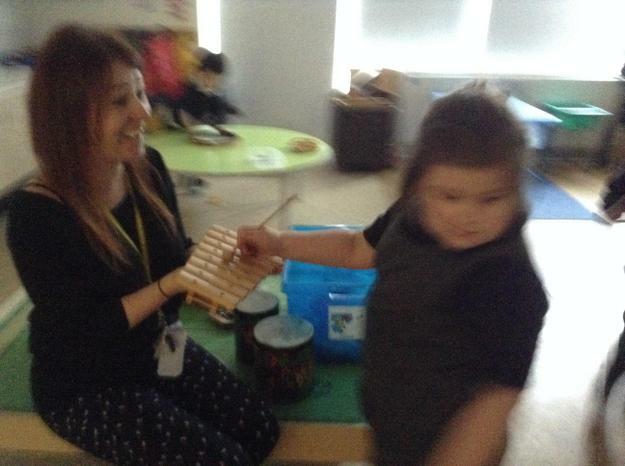 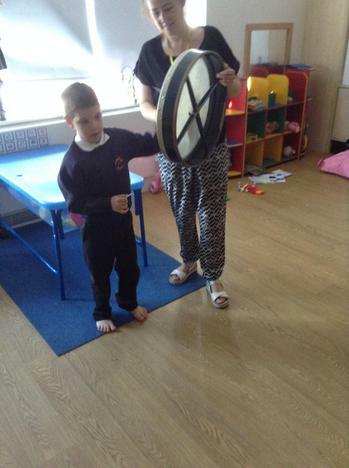 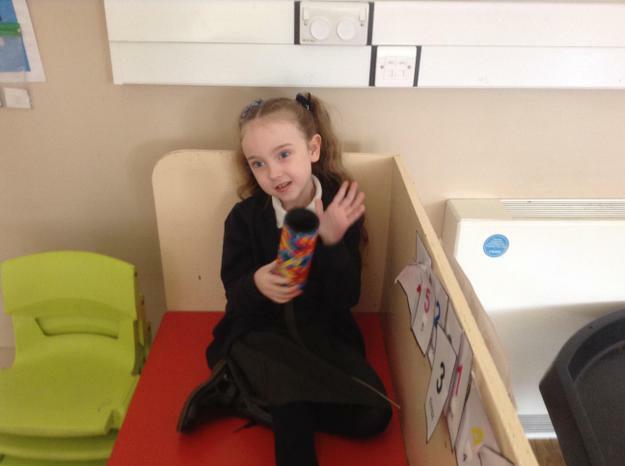 Lime class also enjoy a weekly music session that is focused on developing the children's social interaction and engagement skills. 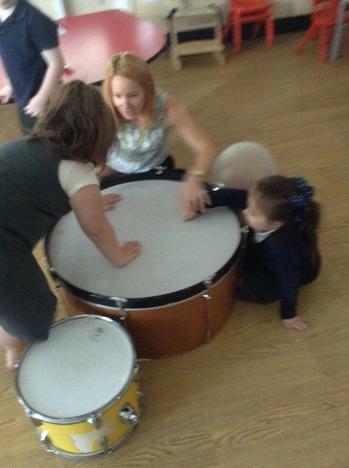 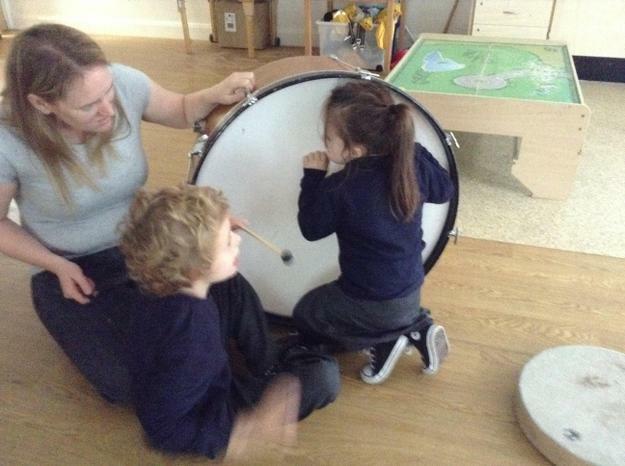 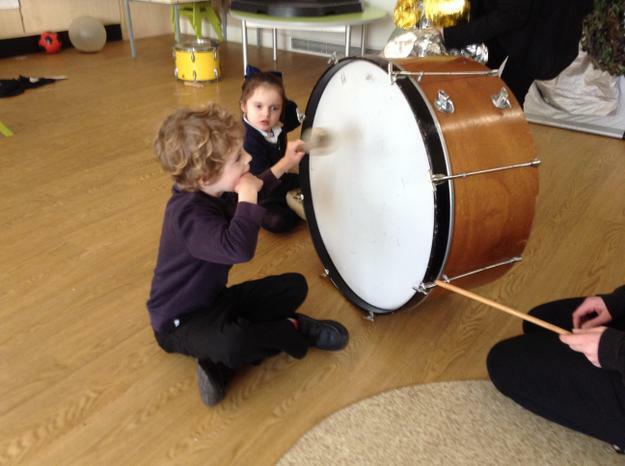 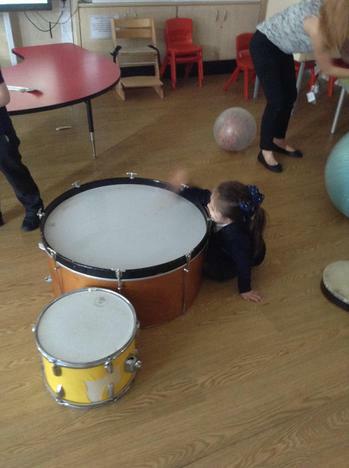 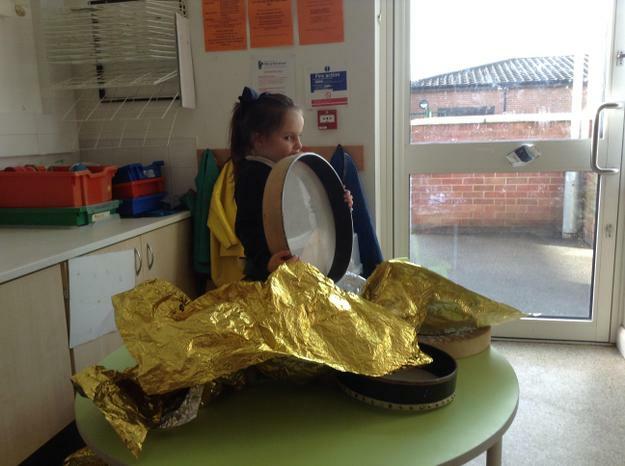 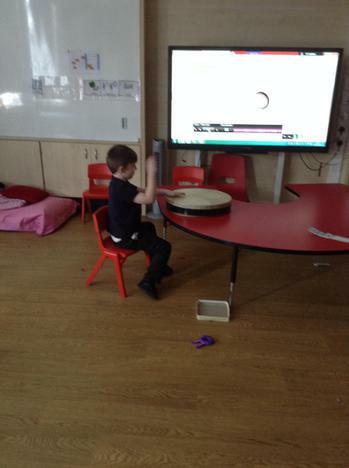 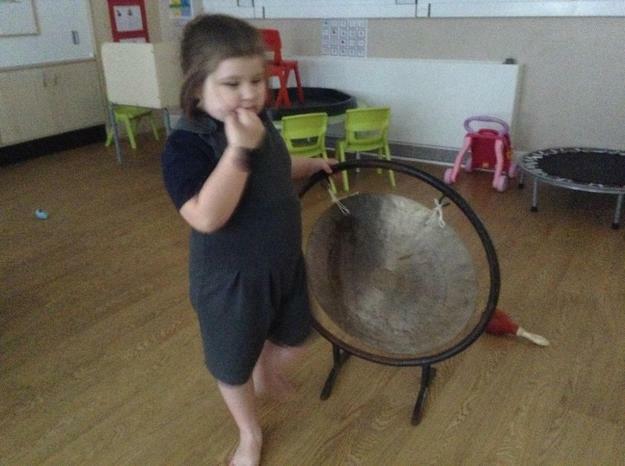 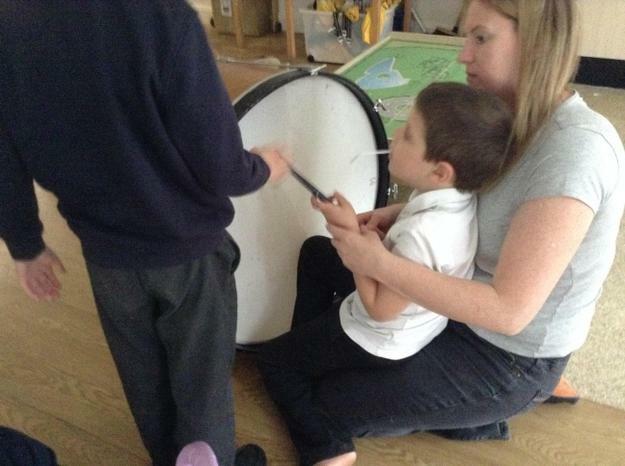 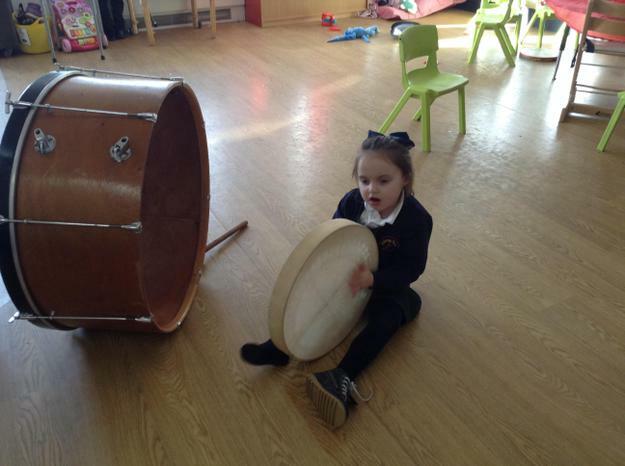 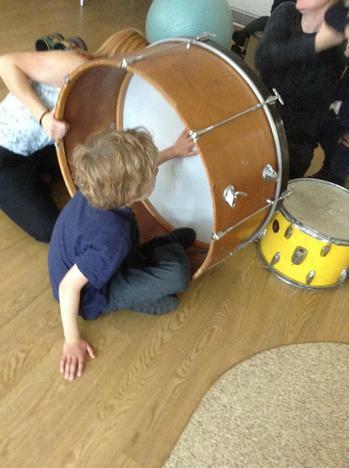 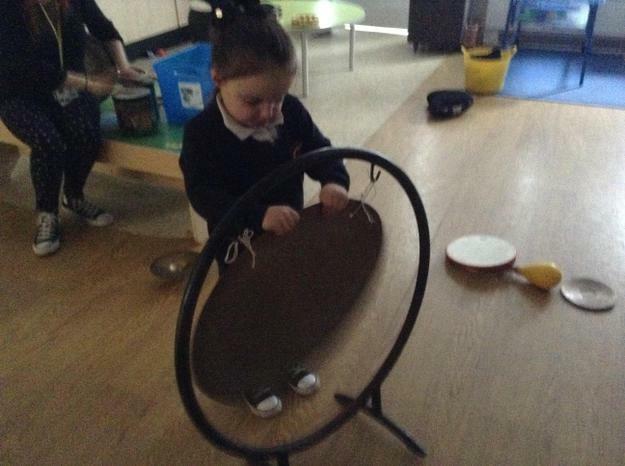 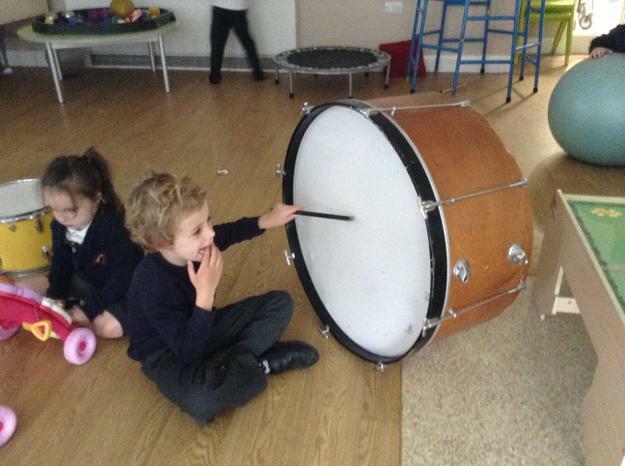 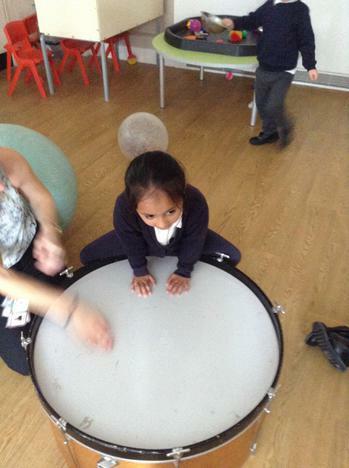 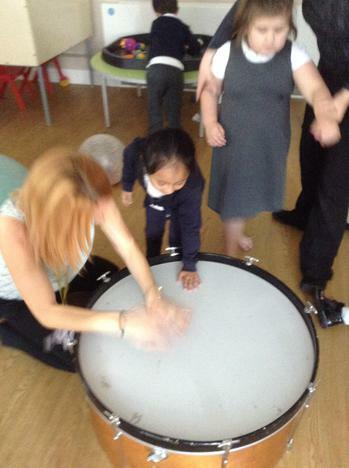 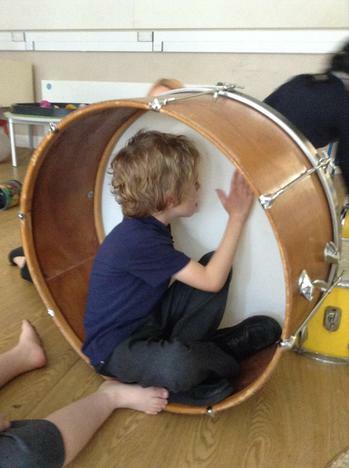 They all really enjoy exploring the big drums!